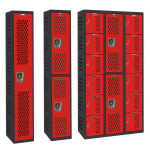 Hallowell Lockers - RS Locker Repair & Installation, Inc. 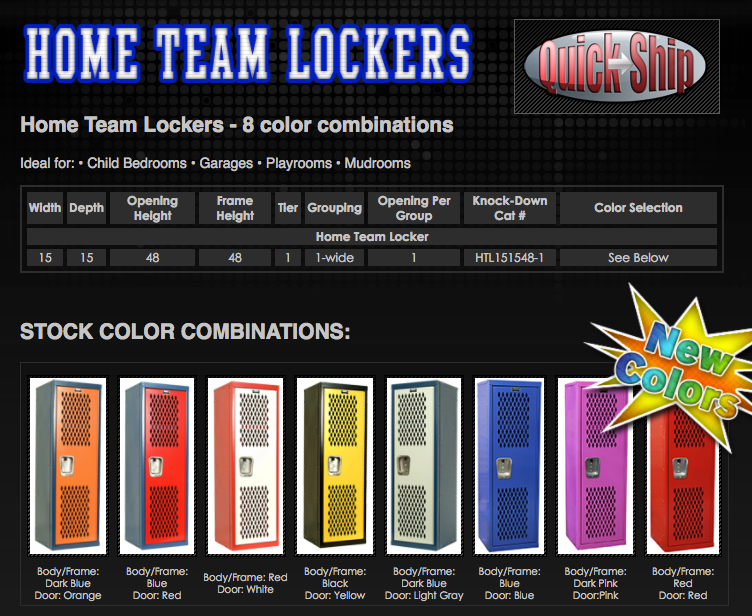 Features: Please note that lockers come in many variations and colors. 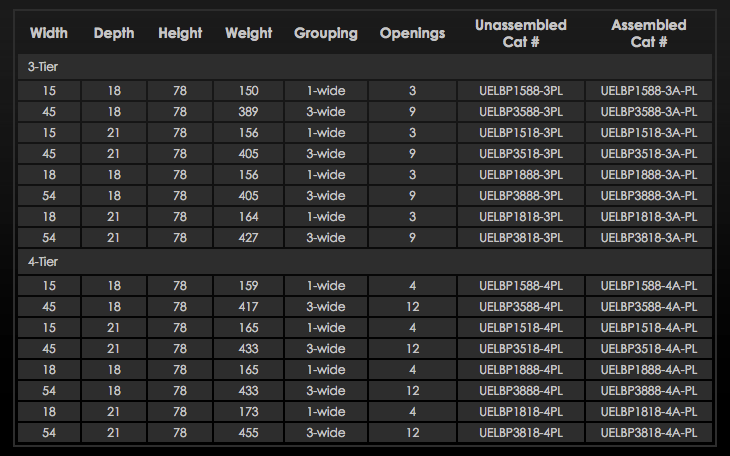 Some may not be shown. Please contact us with any questions! 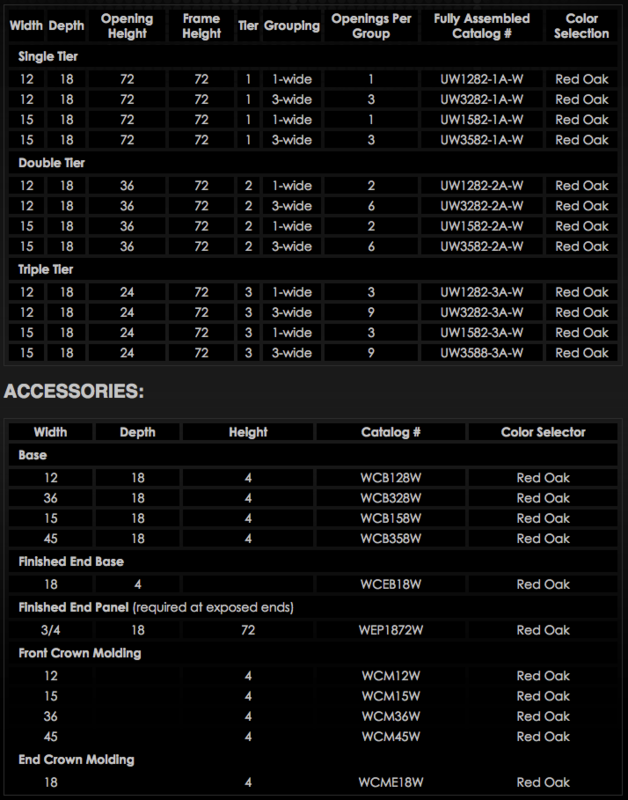 HOOKS: SIngle and double tier models include two single prong hooks. 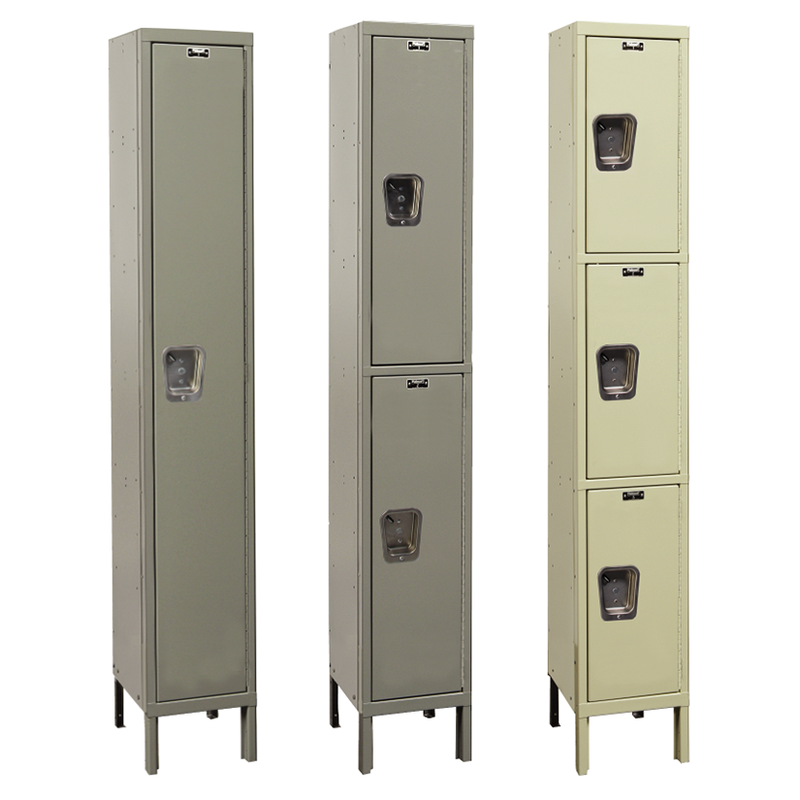 Triple tier includes one double prong hook. 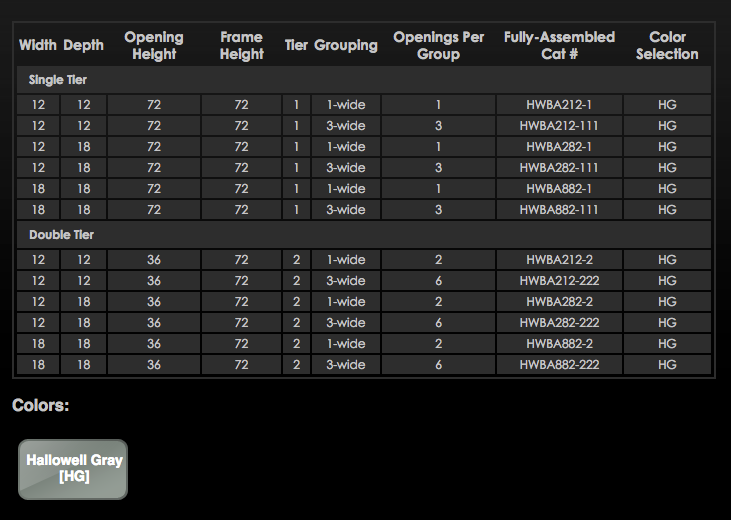 No hooks at six tier. 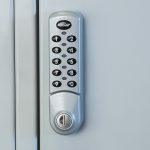 HANDLE: Stainless steel recessed handle with multi-point gravity lift-type latching for a modern look and added safety. 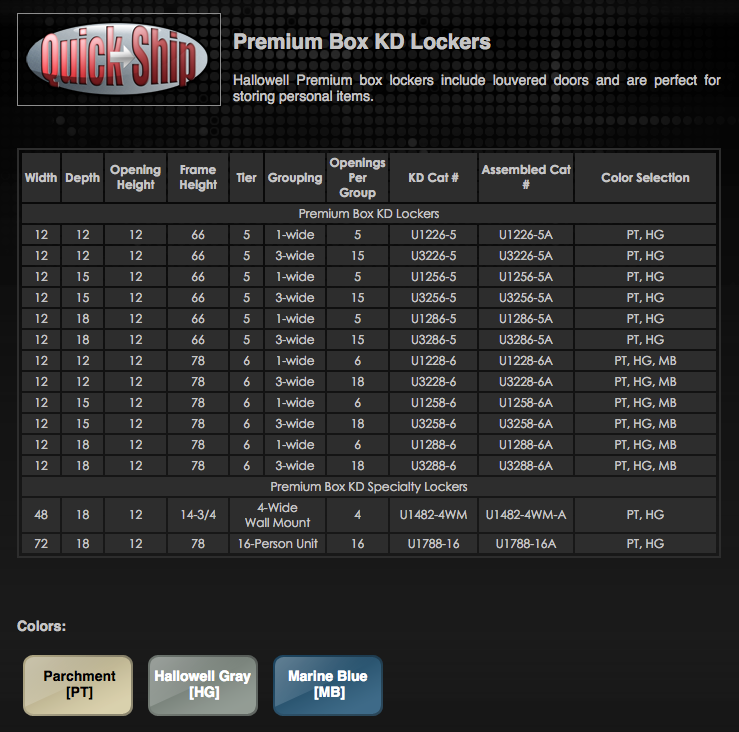 Recessed handle protects finish from being marred by padlock. HOOKS: One double prong ceiling hook and two single hooks per single and double tier opening. One double ceiling hook per triple tier opening. 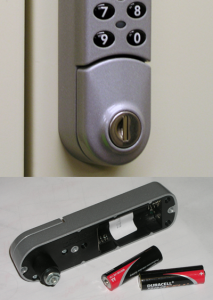 HANDLE: Single-point projecting friction catch door pull prepared for both padlock or built-in lock. No moving parts insures quiet maintenance-free operation. LEGS: 6″ high legs are standard. 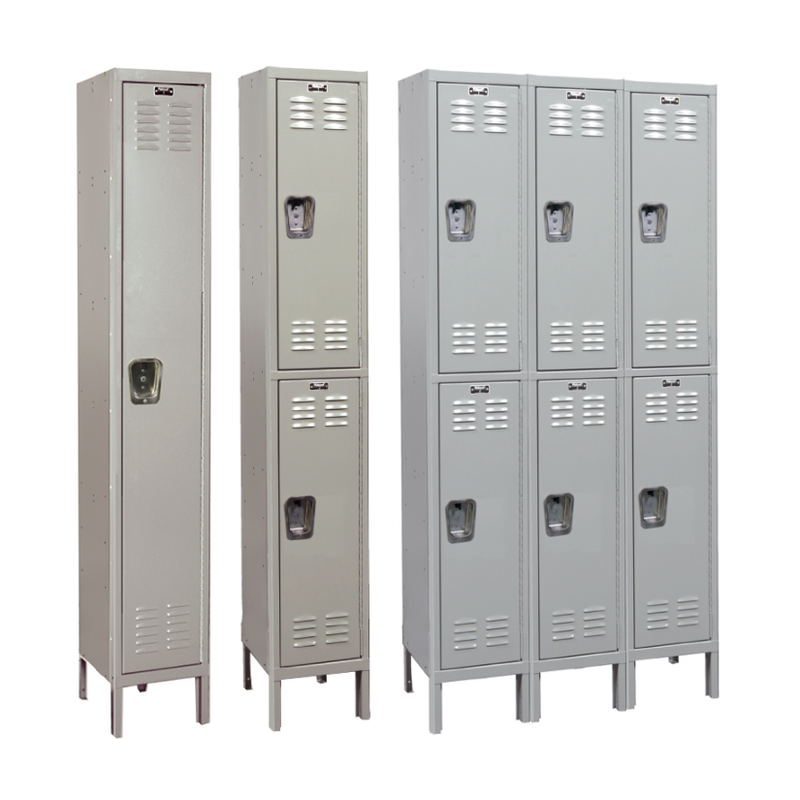 Lockers without legs are available for a nominal charge. 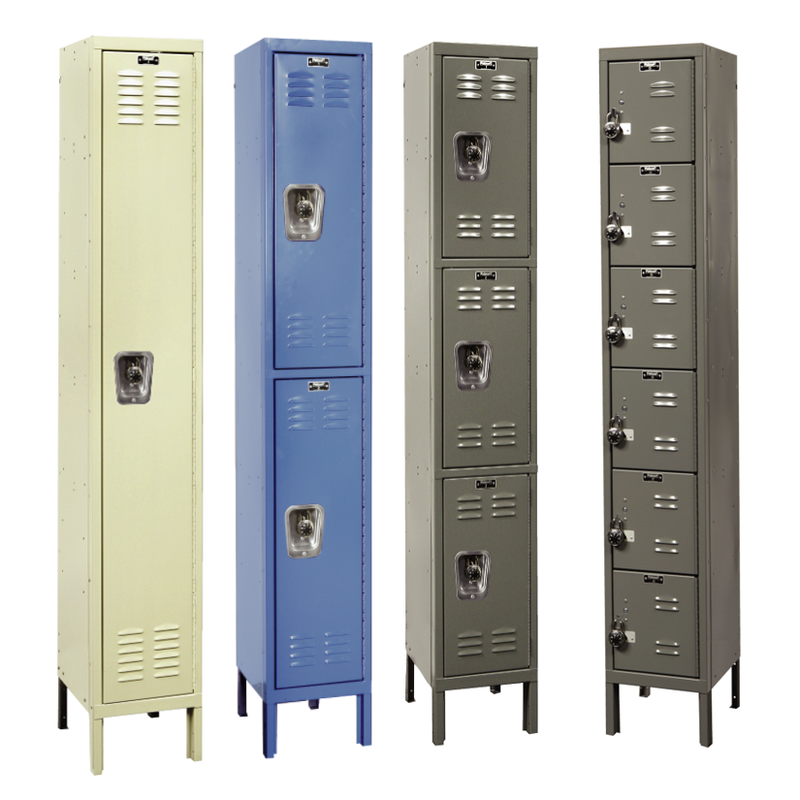 APPEARANCE: Parchment, Hallowell Gray and Marine Blue lockers. 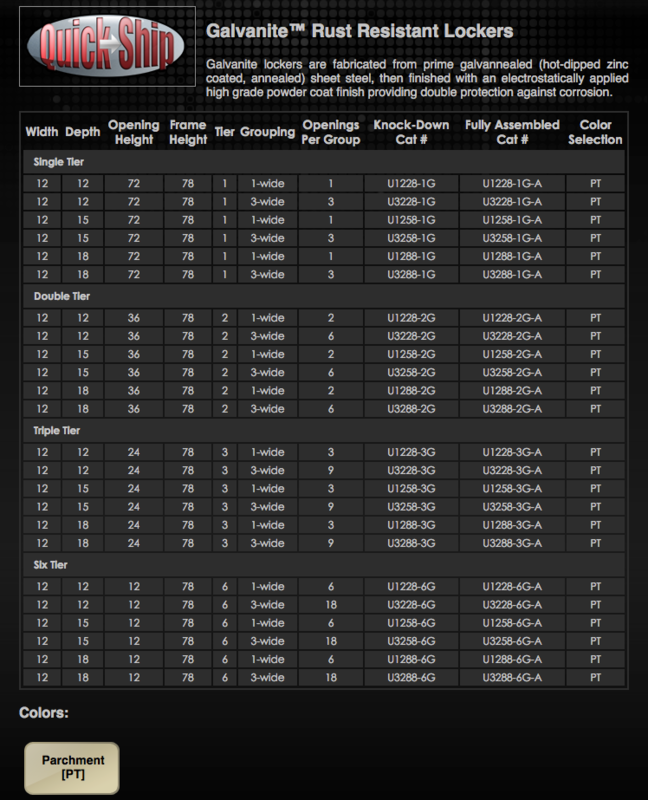 Order Finished End Panels for exposed row ends if desired. 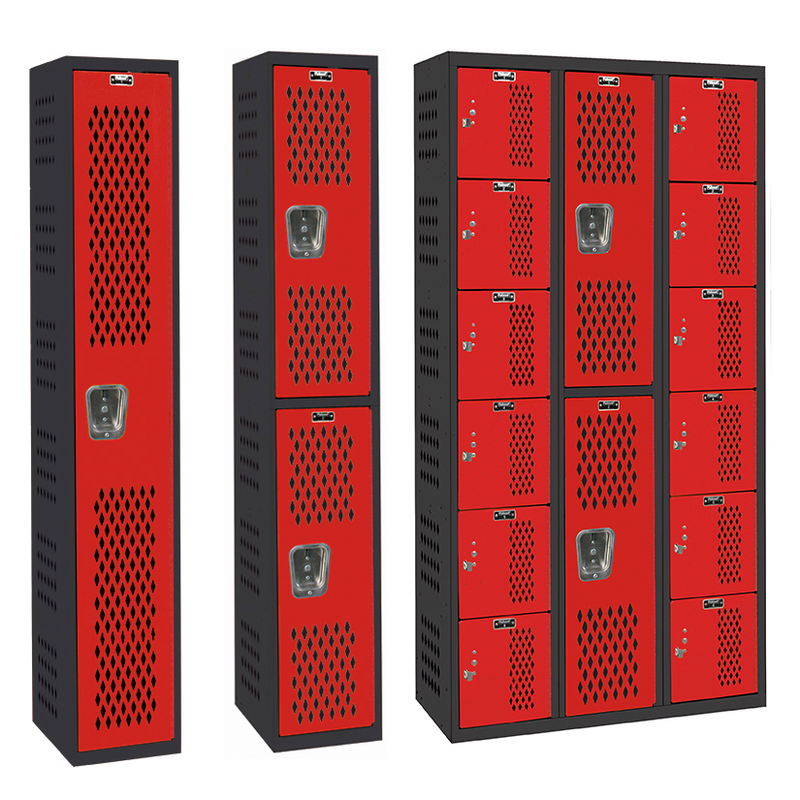 Finished End Panels install over top of universal side panels adding strength and rigidity at exposed row ends and can be ordered to match locker door/frame color. HANDLE: (wardrobe): Stainless steel recessed handle with multi-point gravity lift-type latching. 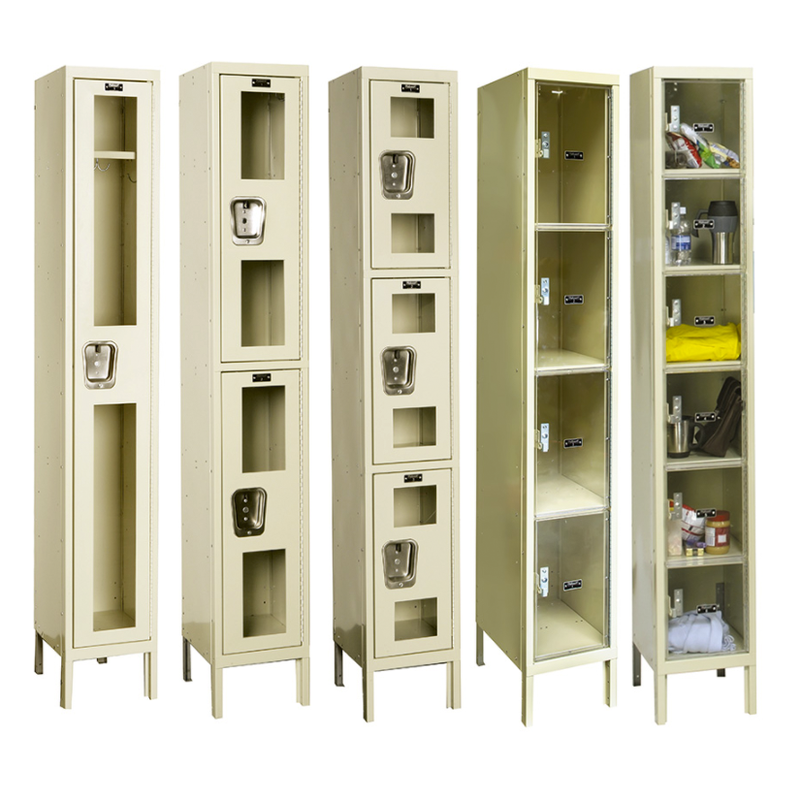 Recessed handle protects finish from being marred by padlock. 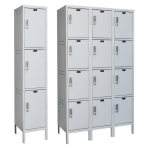 HANDLE: (box): Box lockers include a projecting single-point friction catch door pull. No moving parts insures quiet maintenance-free operation. HOOKS: One double prong ceiling hook and two single hooks per single and double tier opening. One double ceiling hook for triple tier. 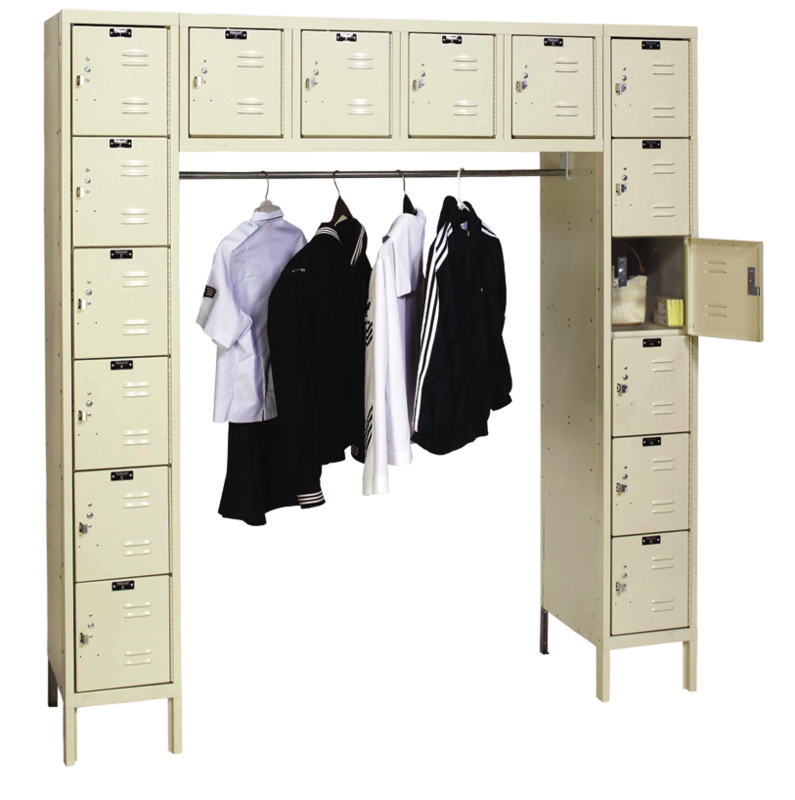 No hooks for box lockers. HANDLE (WARDROBE): Stainless steel recessed handle with multi-point gravity lift-type latching. 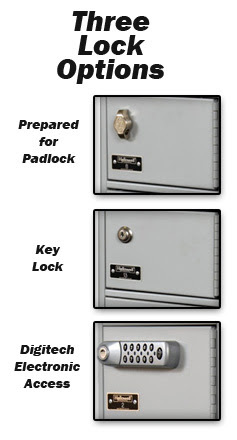 Recessed handle protects finish from being marred by padlock. 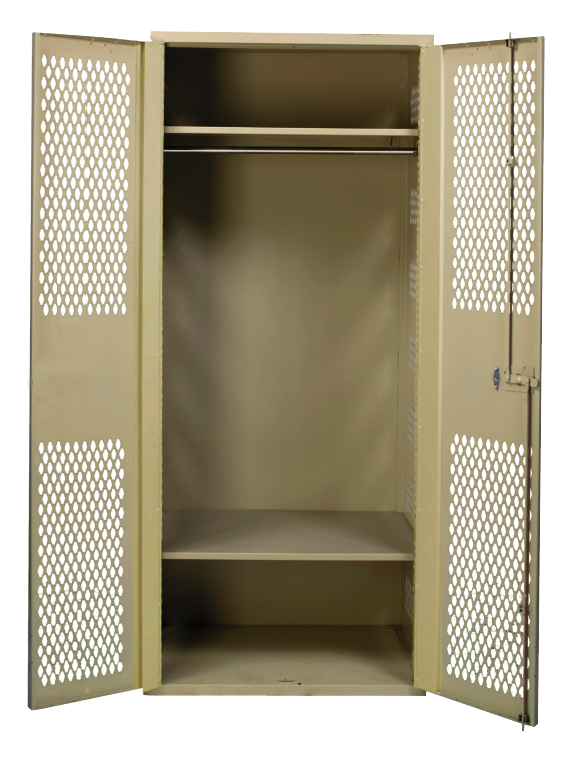 HANDLE (BOX): Box lockers include a projecting single-point friction catch door pull prepared for both padlock or built-in lock. 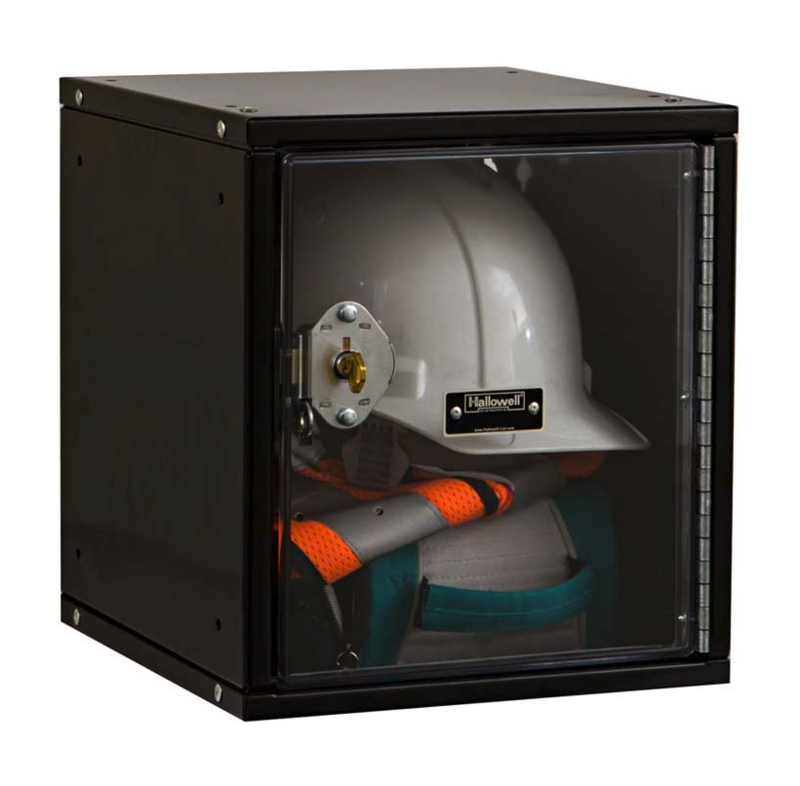 No moving parts insures quiet maintenance-free operation. HOOKS: One double prong ceiling hook and two single hooks per single and double tier opening. One double ceiling hook for triple tier. 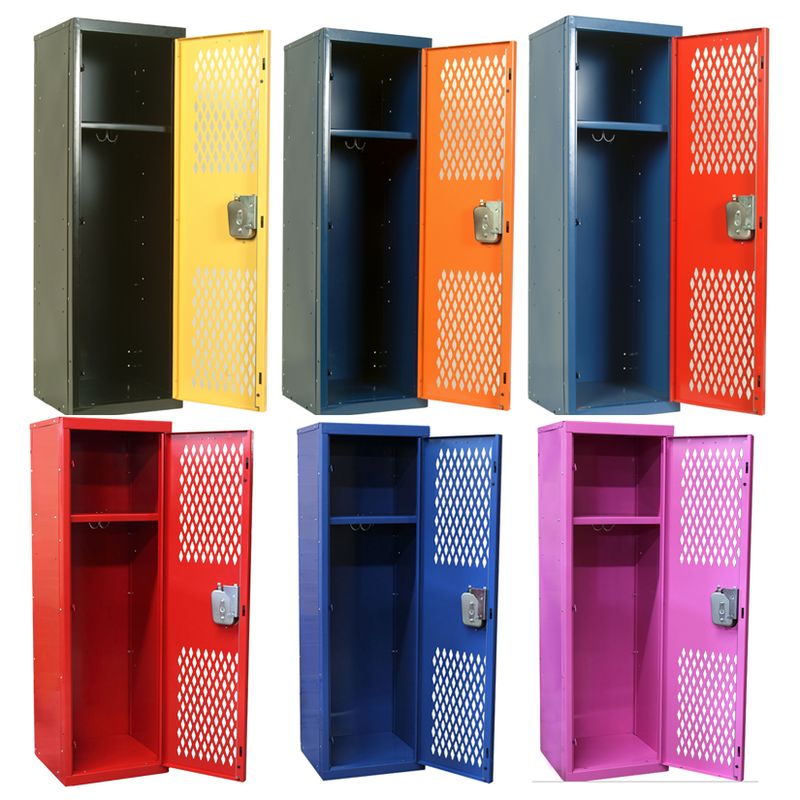 No hooks for six tier lockers. 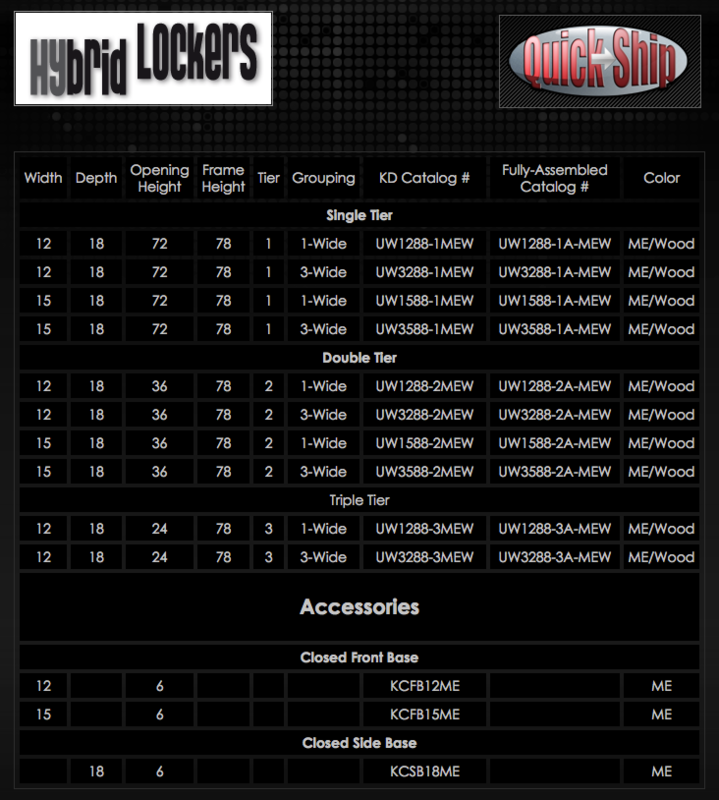 HINGES:2-1/2″ 5-knuckle hinges. 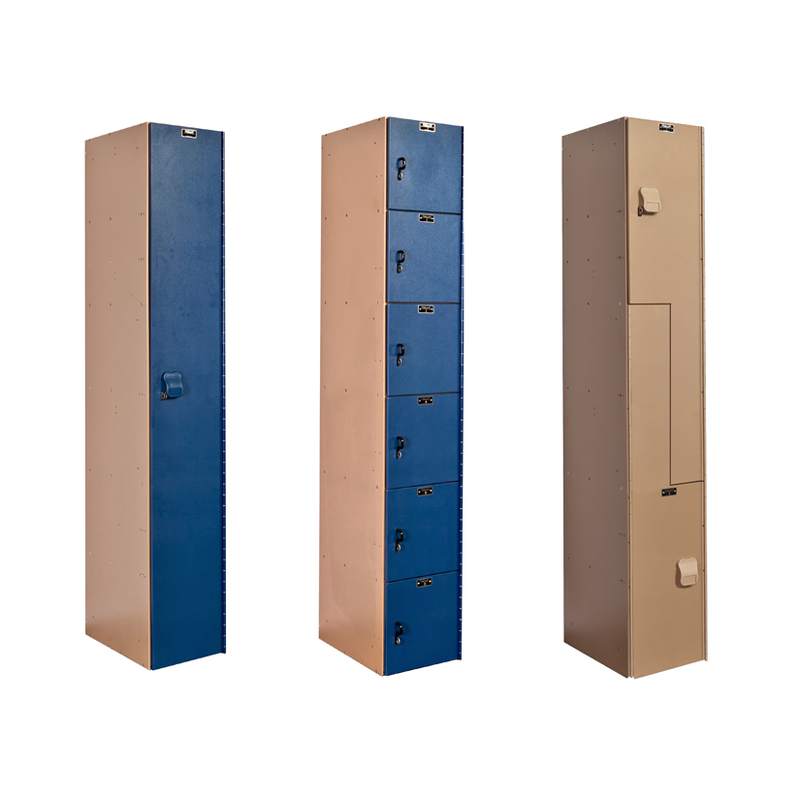 Three hinges per single tier door and two hinges per double or six tier door. HANDLE: Single and double tier lockers have a deep drawn stainless steel recessed handle with multi-point gravity lift-type latching. 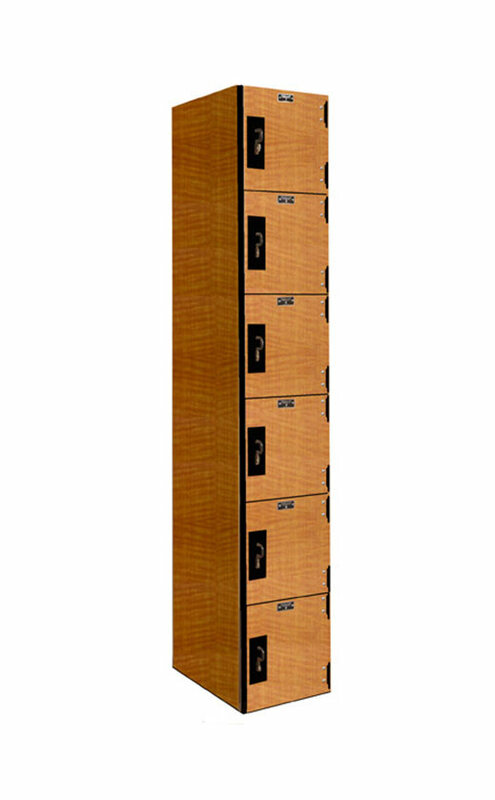 Six tier lockers have single-point finger-pull. 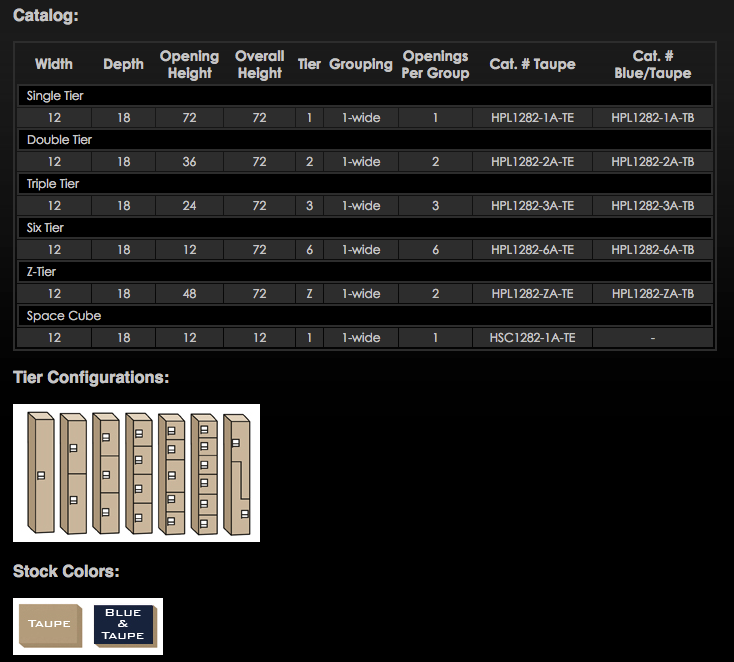 HOOKS: One double prong ceiling hook and three single hooks per single and double tier opening. No hooks for six tier. 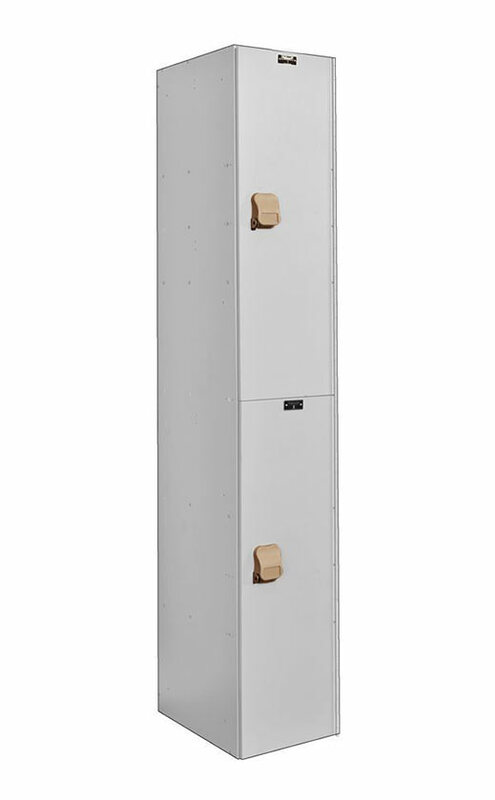 HANDLE: Stainless steel recessed handle with multi-point gravity lift-type latching. 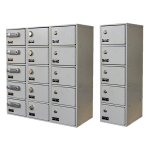 Recessed handle protects finish from being marred by padlock. HOOKS: One double prong ceiling hook and two single hooks per single and double tier opening. 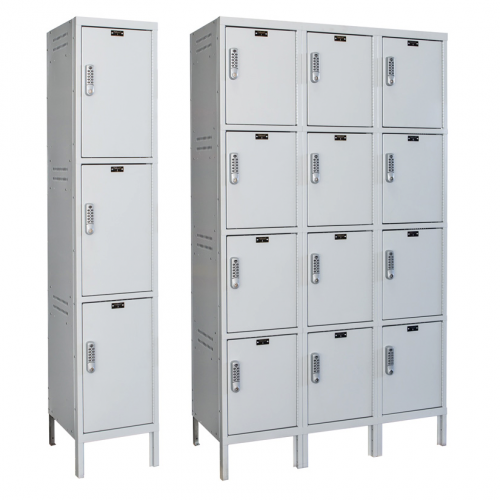 LEGS: All stock lockers are standard with 6″ high legs. 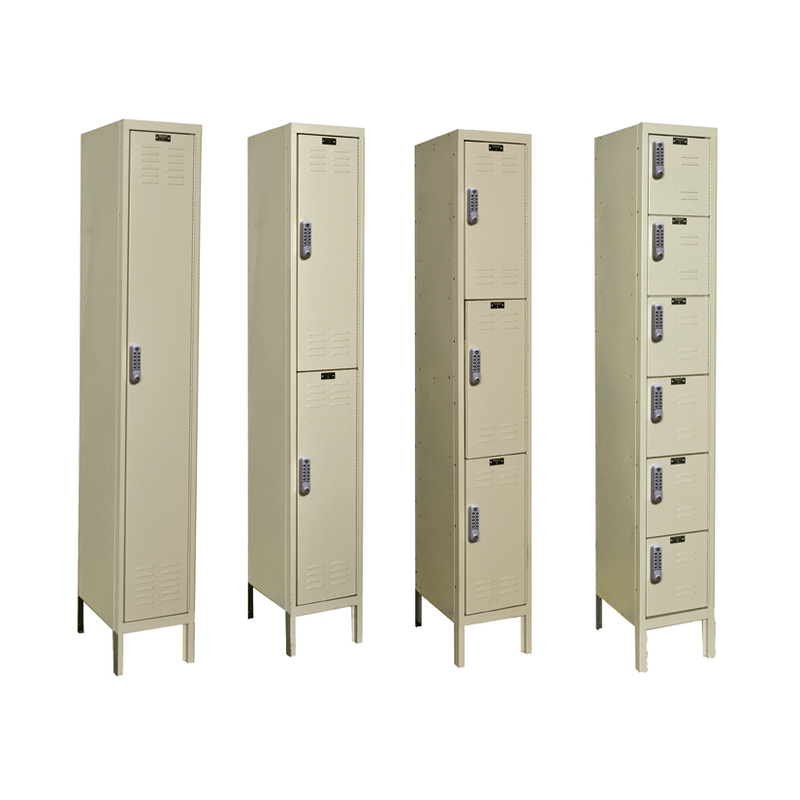 Lockers without legs are available for a nominal charge. HANDLE (BOX): Single-point projecting friction catch door pull prepared for both padlock or built-in lock. 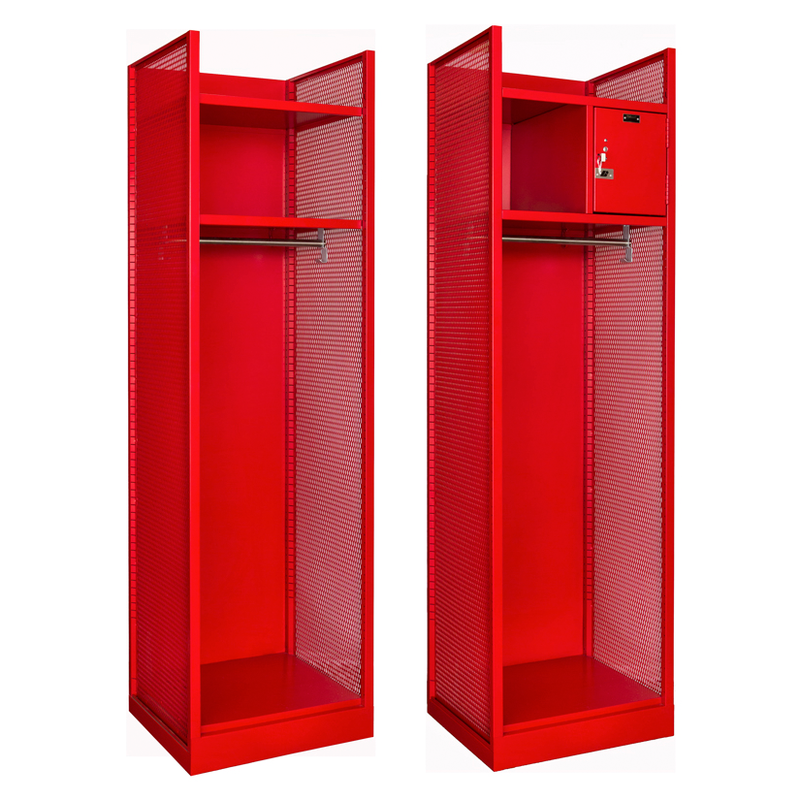 SHELVES: Hat shelf is included in 60″ and 72″ high single tier lockers. 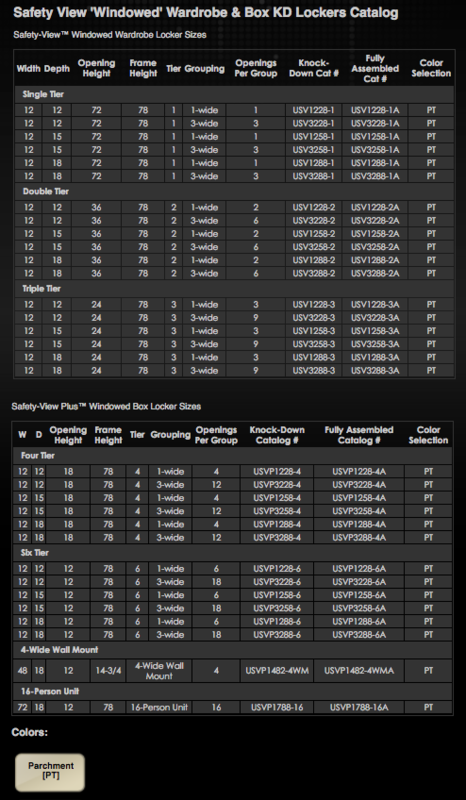 NOTES: Meets UL flammability standards, Polycarbonate is approved by the Consumer Product Safety Commission (CPSC16CFR 1201). Powered by 2 AA batteries (included) which provide in excess of 10,000 uses. 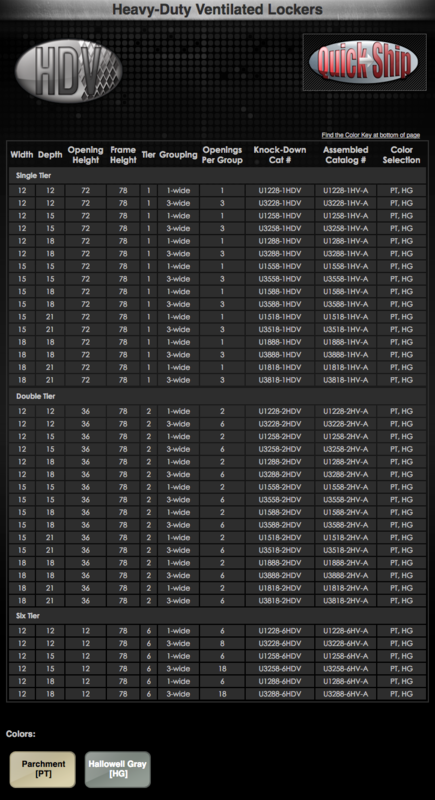 LED’s will flash to indicate low battery level. 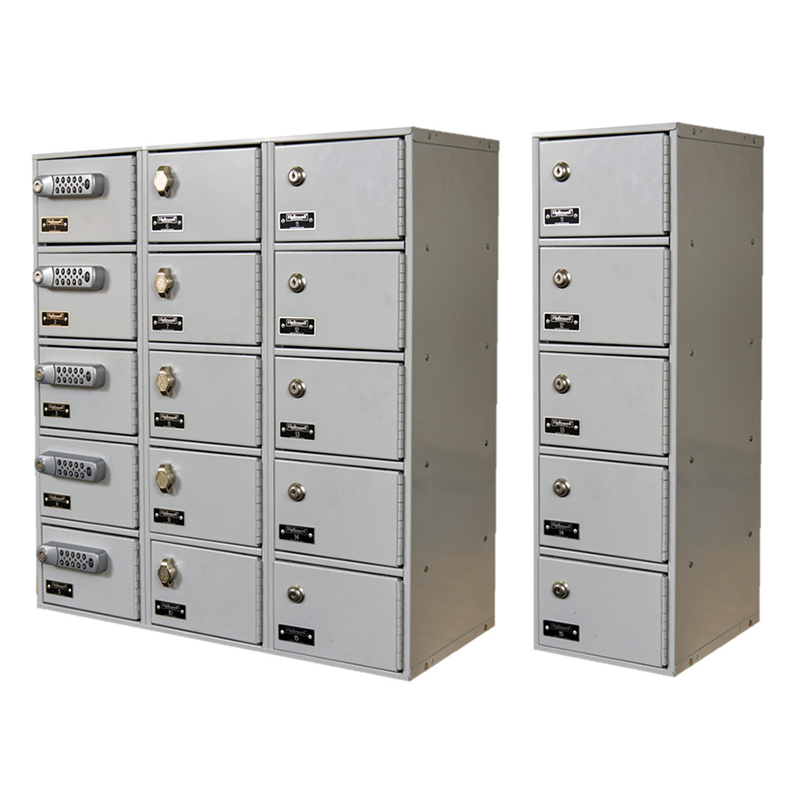 Locker can be opened when batteries are low or dead with mechanical master key. 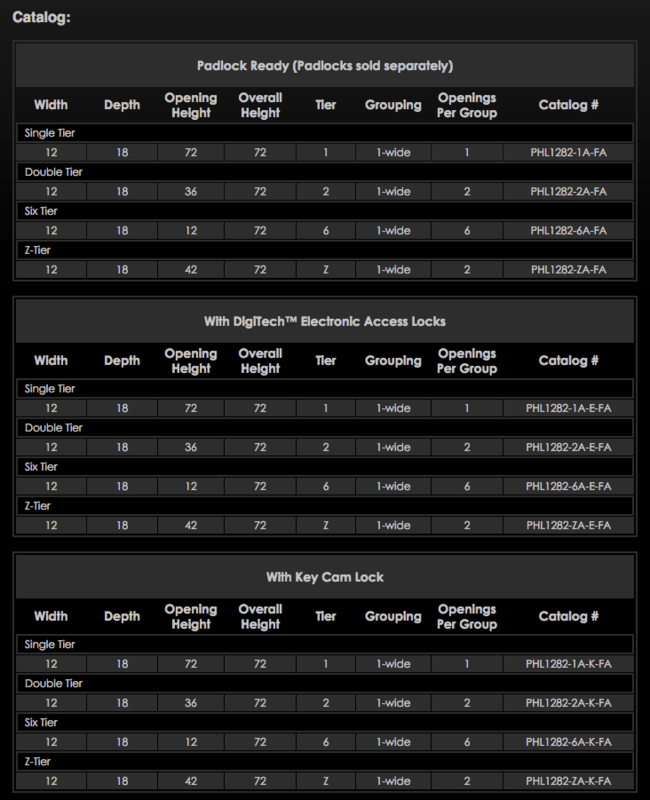 8-digit master and sub-master codes for two levels of management security. 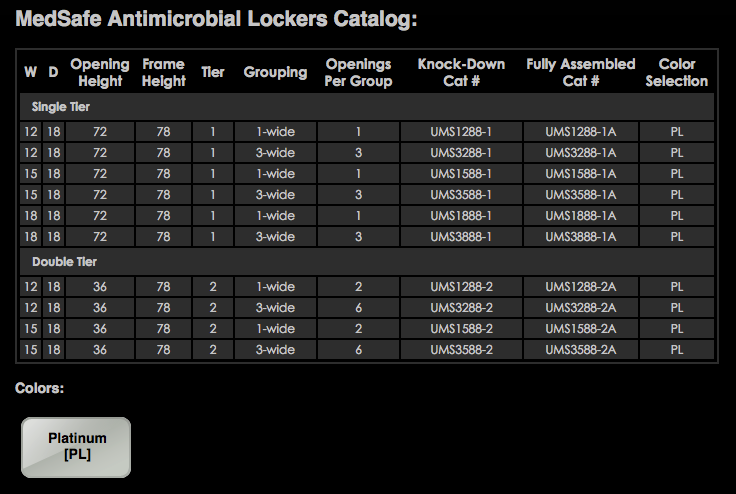 DAY USE MODE: User can lock and unlock door with a user selected code. Upon Returning, the user enters the 4-digit code to unlock door. 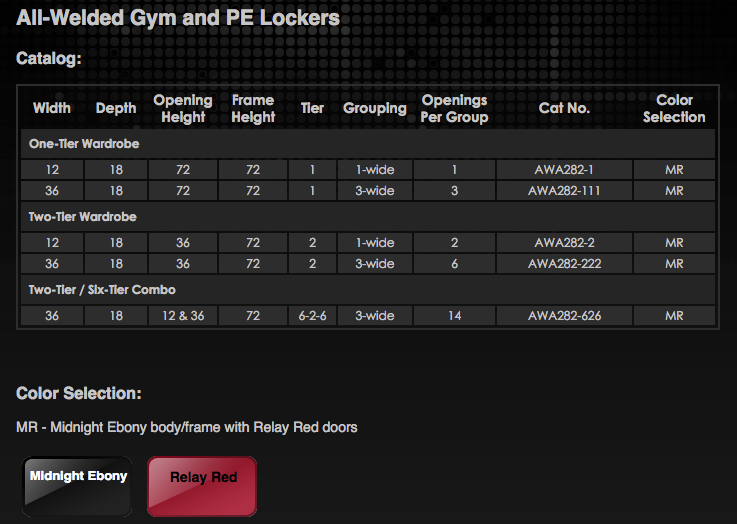 Code is then erased and the locker is available for the next user. 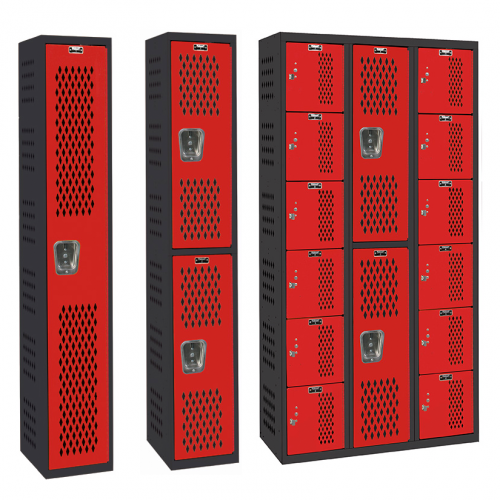 PERMANENT USE MODE: User enters a pre-programmed 4-digit code to unlock and use the locker repeatedly. 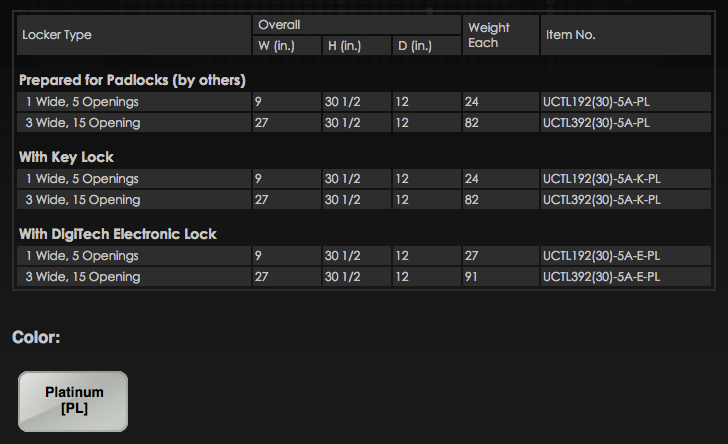 Lock does not require a code to re-lock the door. LEGS: 6″ high legs are standard for 16-person. 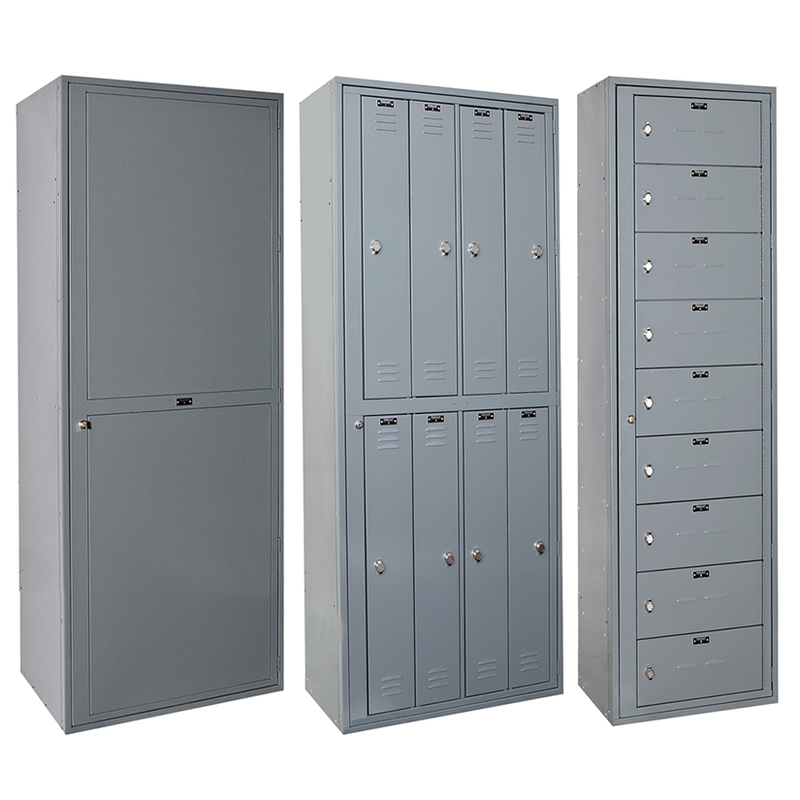 Lockers without legs are available for a nominal charge. 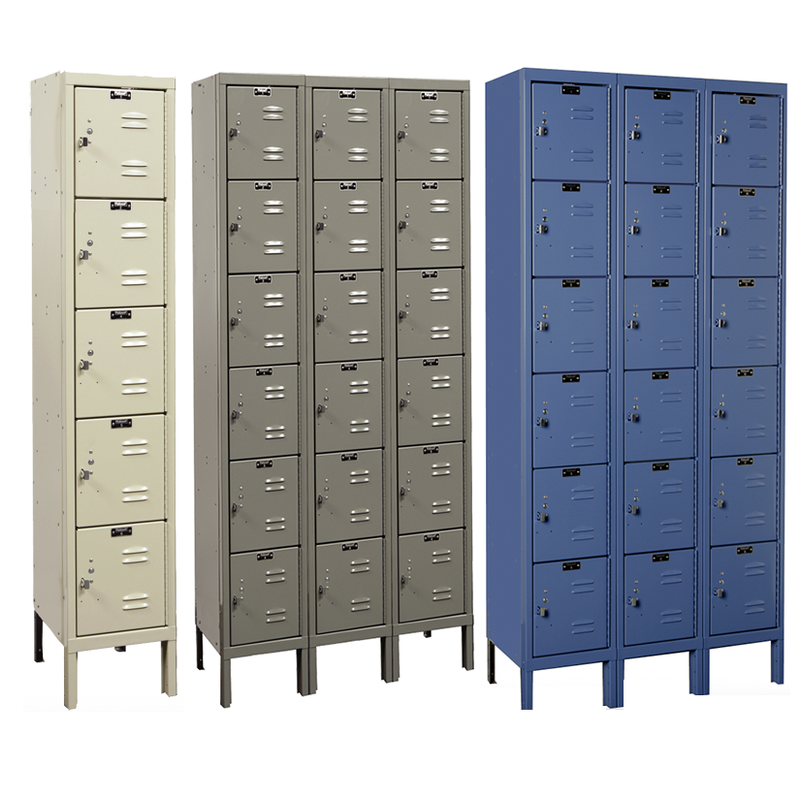 APPEARANCE: Parchment, Hallowell Gray and Marine Blue lockers include matching body colors. 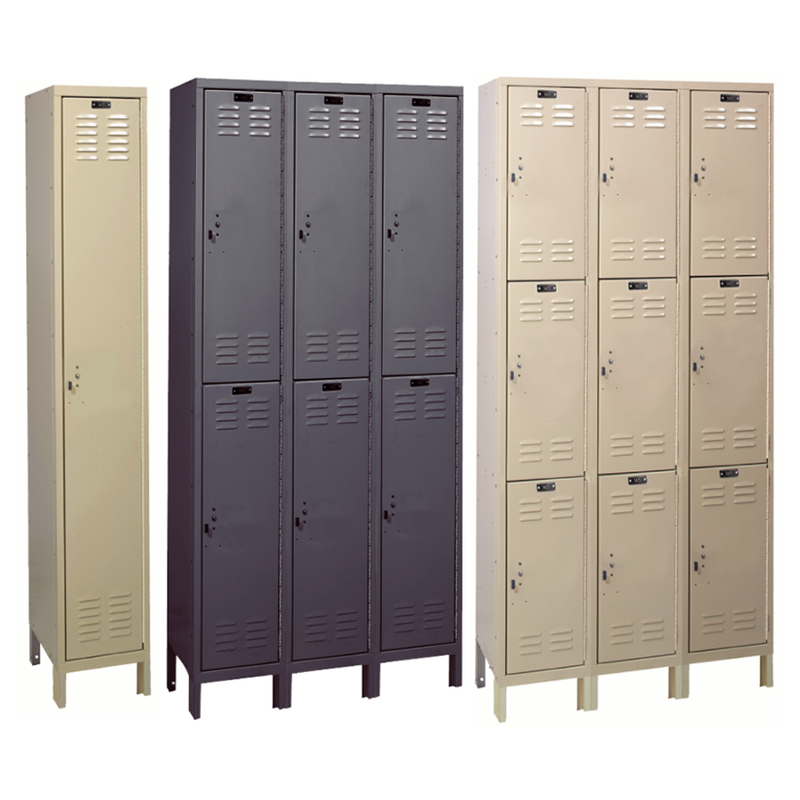 Maroon and Green Mist lockers include Parchment body and sides. 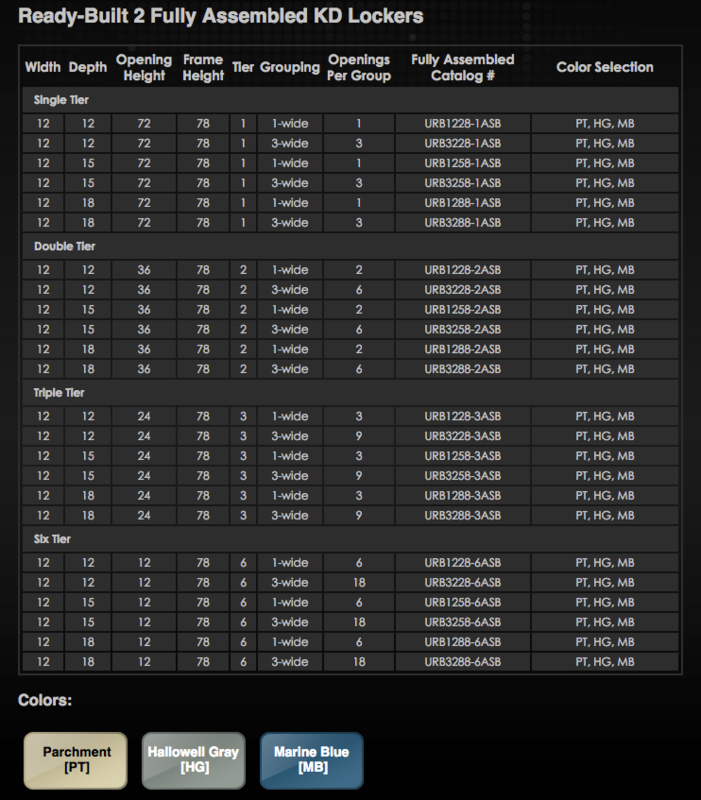 Order Finished End Panels for exposed row ends if desired. 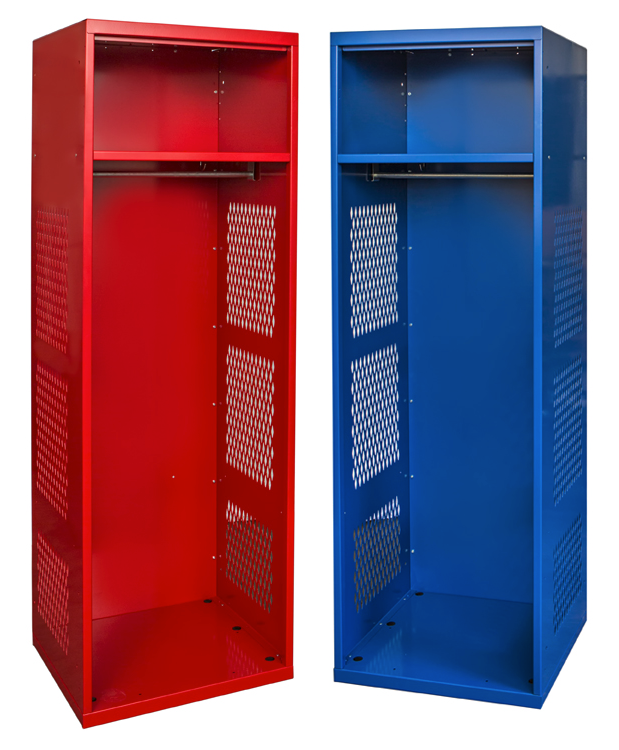 Finished End Panels install over top of universal side panels adding strength and rigidity at exposed row ends and can be ordered to match locker door/frame color. 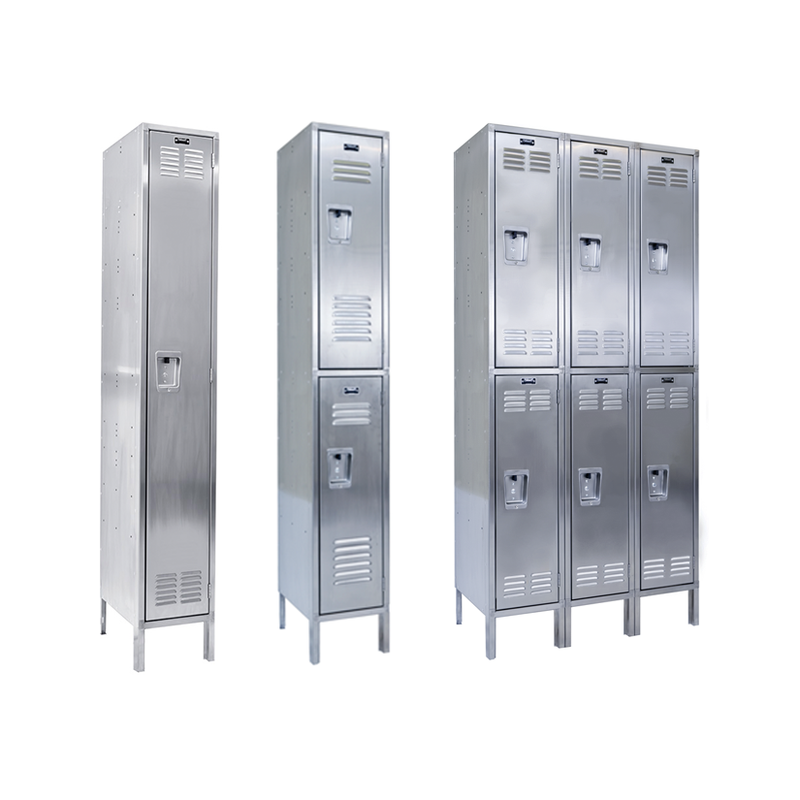 BODY CONSTRUCTION: 16 gauge, Unibody all-welded, sides, galvanneal corrosion resistant sheet steel. 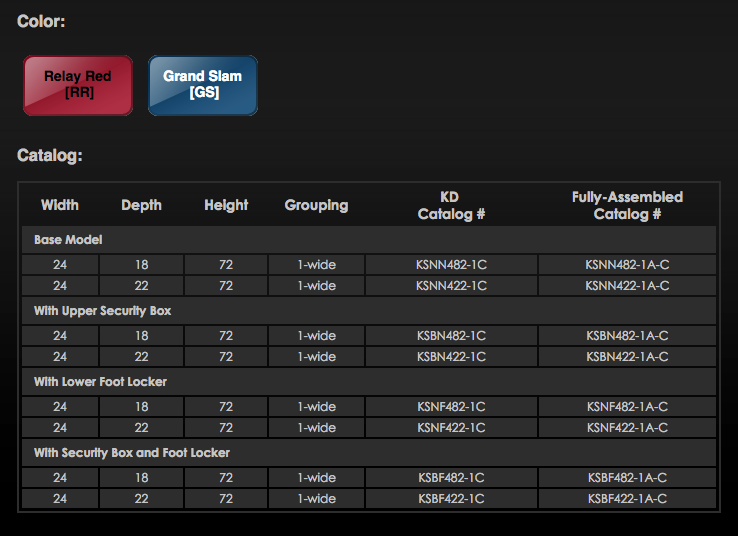 OPTIONAL BASE UNIT: Includes integral drawer pull. 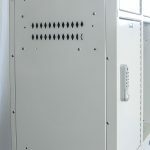 Locking controlled by upper unit doors and self locking when upper doors are closed. 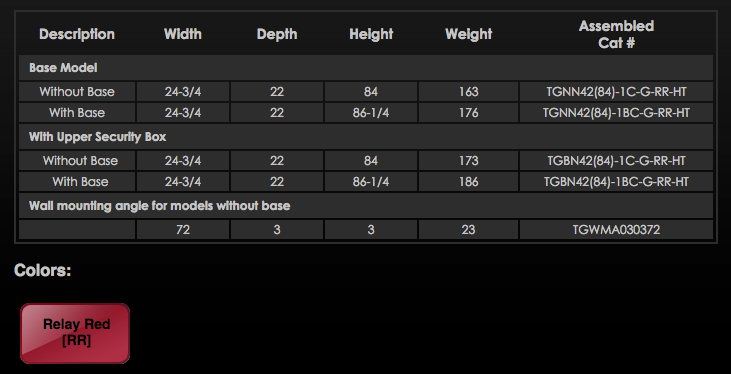 BODY CONSTRUCTION: Fully-framed all-welded construction, 13 gauge 1/2″ fully-framed flattened expanded metal sides, 16 gauge top, 18 gauge solid back and 16 gauge galvanneal bottom. 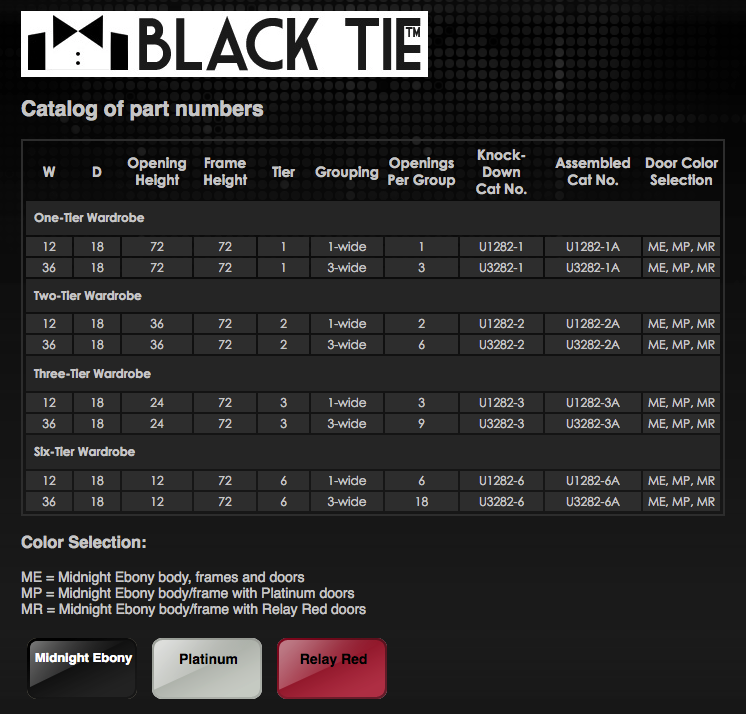 Optional solid sides are available. 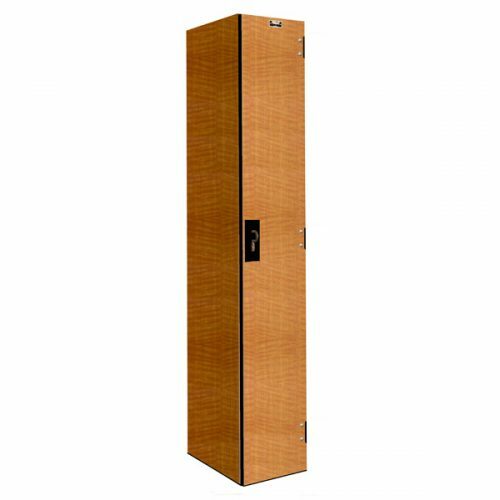 BODY CONSTRUCTION: All-welded construction, 16 gauge heavy-duty body and 18 gauge back, Sides formed to be integral with front vertical frame and are reinforced using two front-to-back channel stiffeners welded to the underside. SHELVES: Upper welded hat shelf. 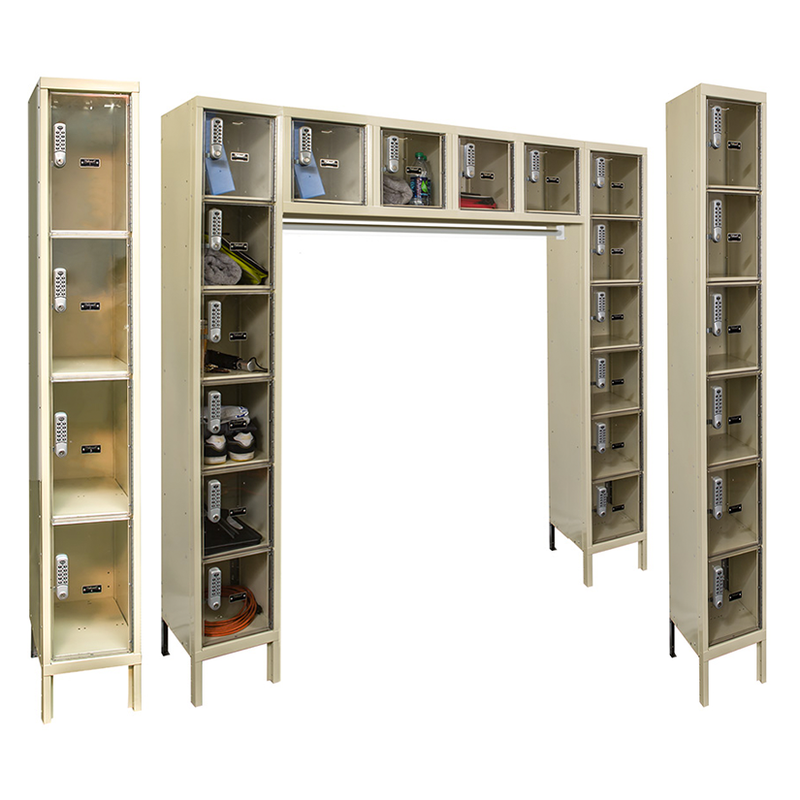 Additional shelves can be ordered and are adjustable on 3″ centers. 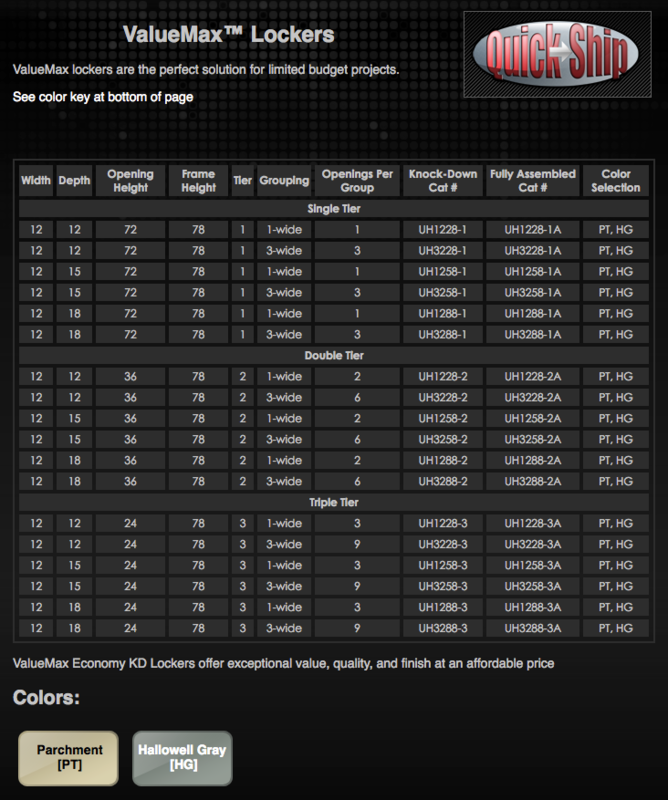 HANDLE:Single-point projecting friction catch door pull prepared for both padlock or built-in lock. 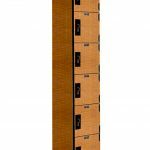 SHELVES: Four 16 gauge sheet steel welded-in fixed shelves are fabricated from galvanneal corrosion resistant sheet steel add additional rigidity to the unit. 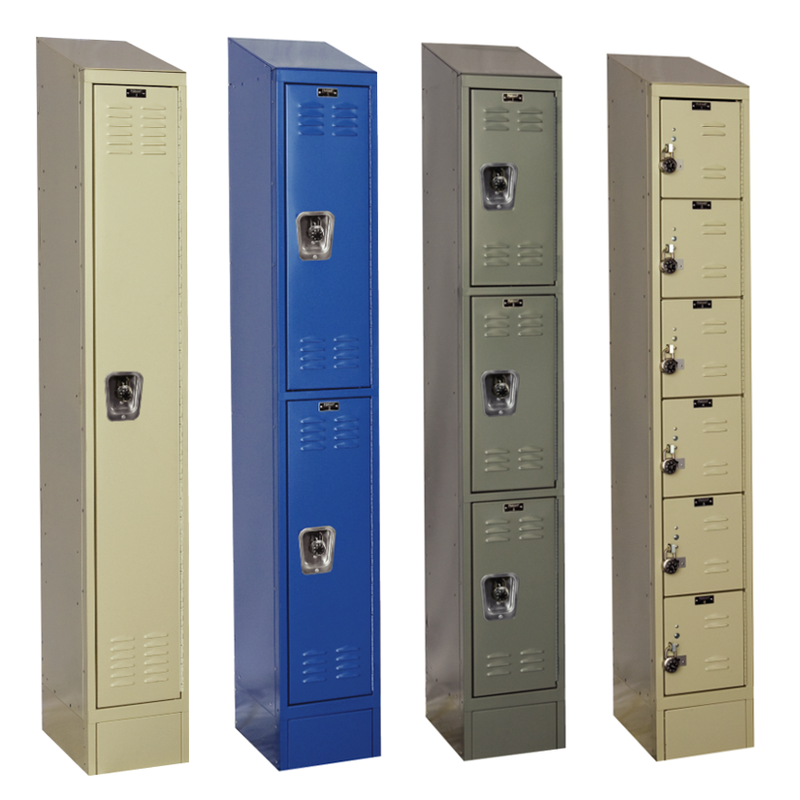 HOOKS: Teen locker shall include one double hook and two single hooks attached to hat shelf. 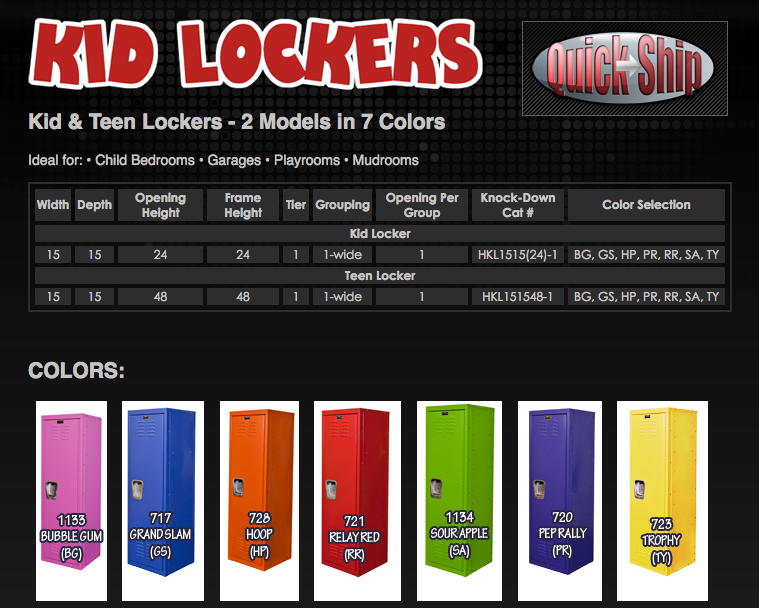 No hooks for Kid Locker. 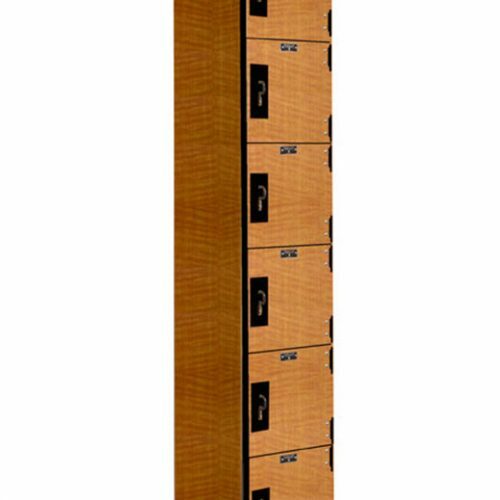 BODY CONSTRUCTION: Knock-down with 16 gauge cold rolled steel top, bottom and diamond perforated sides and 18 gauge back. 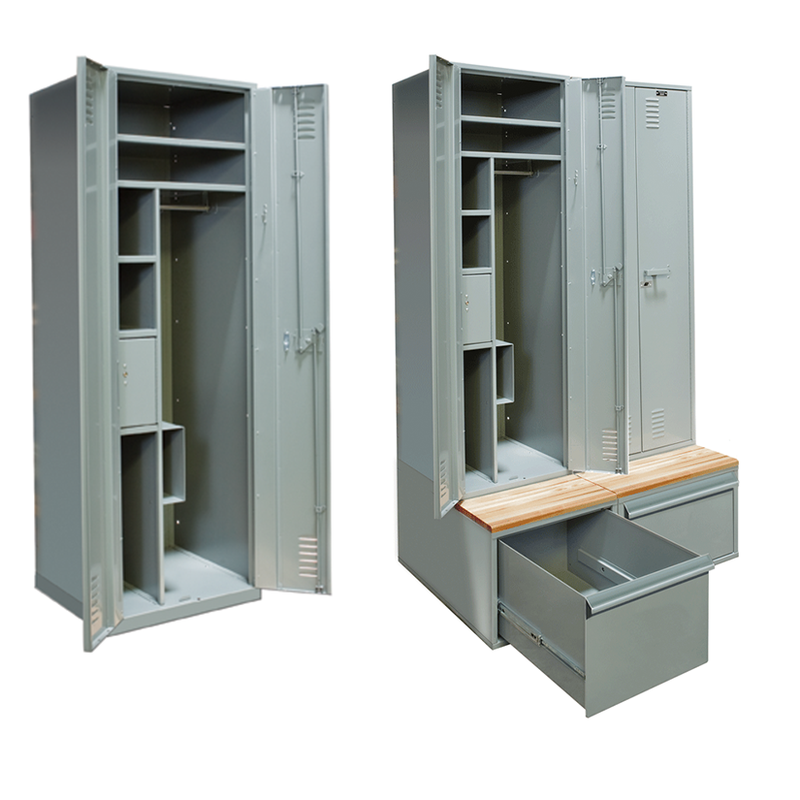 Security box door, reinforced seat and foot locker front are 14 gauge. 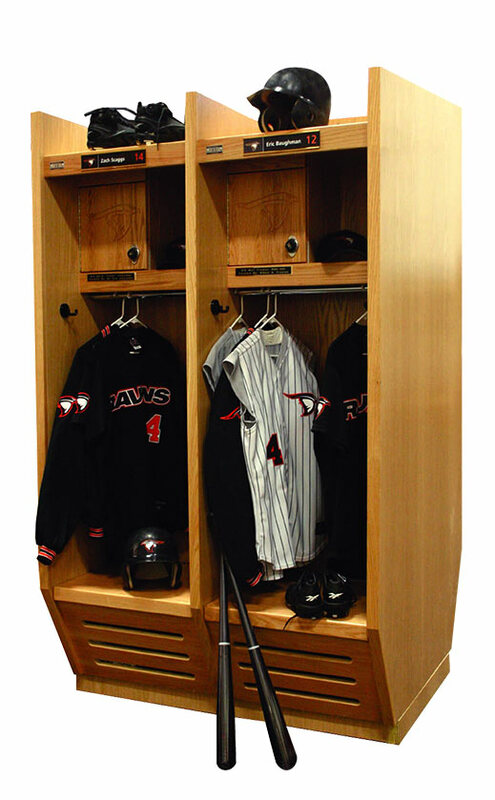 HOOKS: Home Team locker shall include one double hook and two single hooks attached to hat shelf. 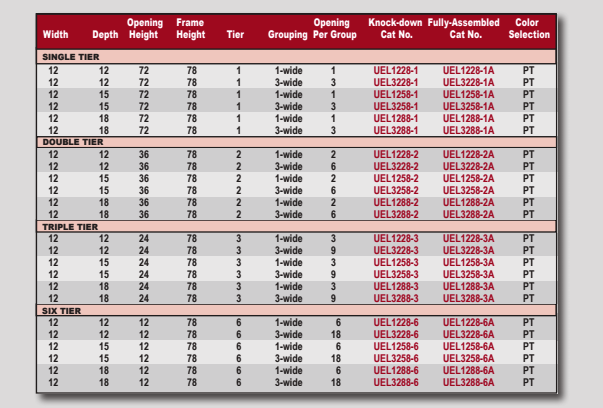 Low profile frame members maximize clear opening. 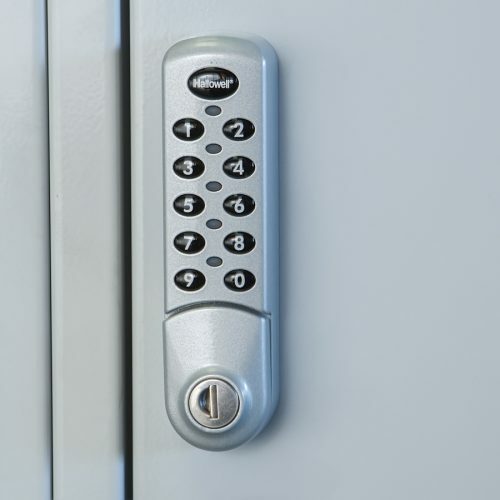 Keyless Access uses a PIN controlled digital lock. 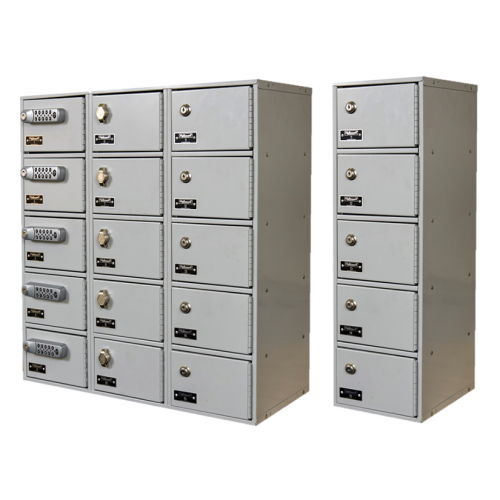 Ideal for use in government buildings, schools, health clubs or any location where personal items, cell phones and tablets need to be securely stored. 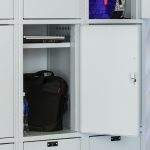 Electronic access door keeps items secure. Prepared for after market wiring to allow charging. 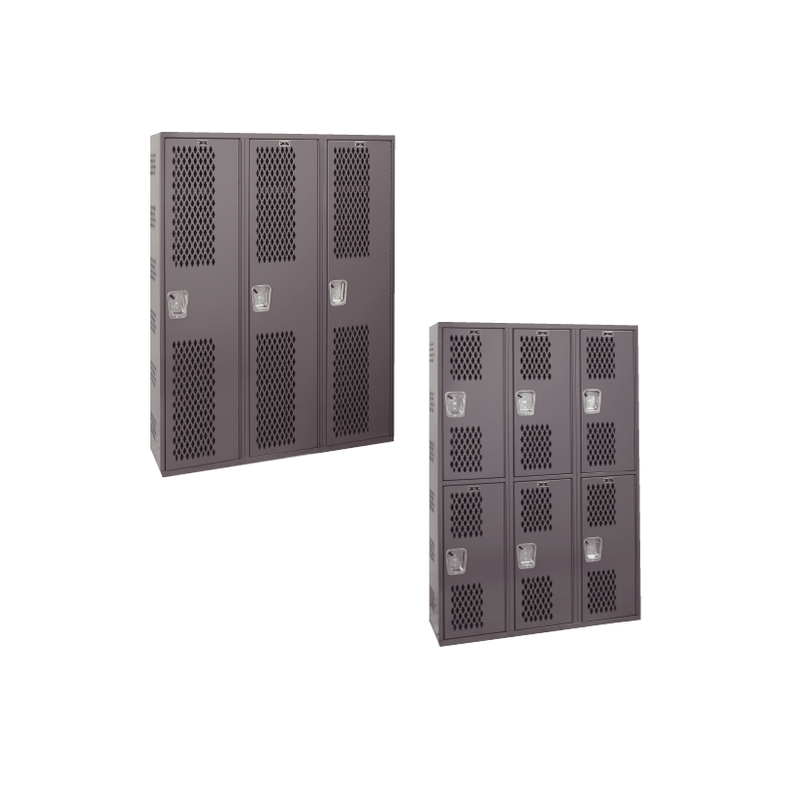 Side ventilation allows maximum airflow for cooling while maintaining security. 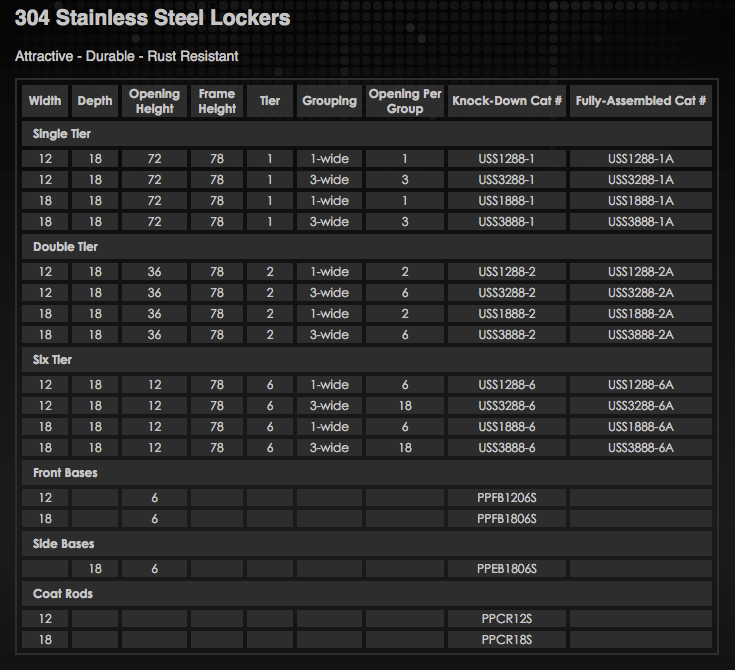 711 Platinum (light gray) powder coat finish. 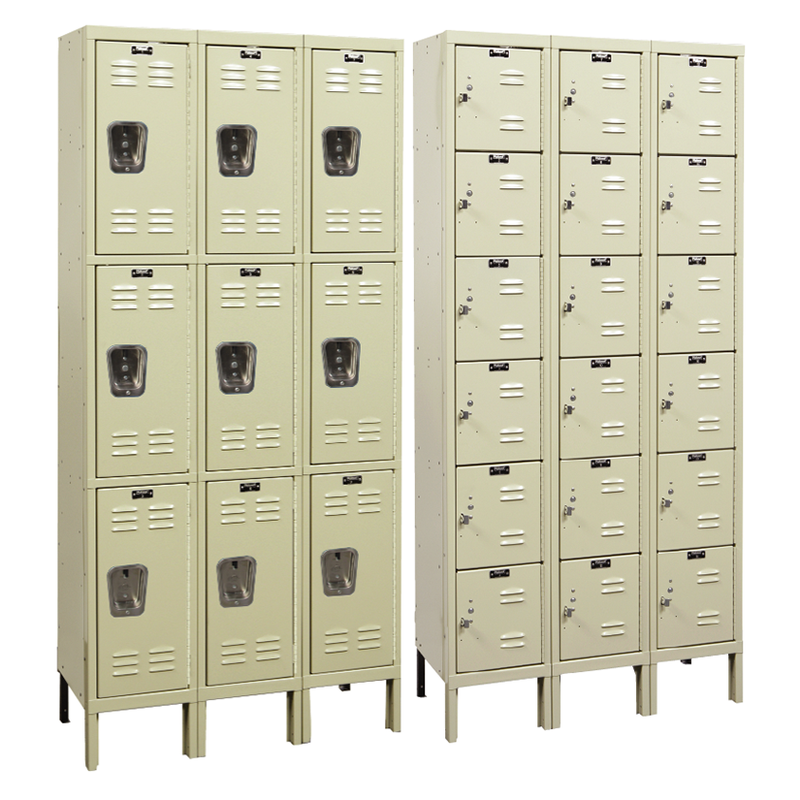 These lockers are high quality fine furniture. 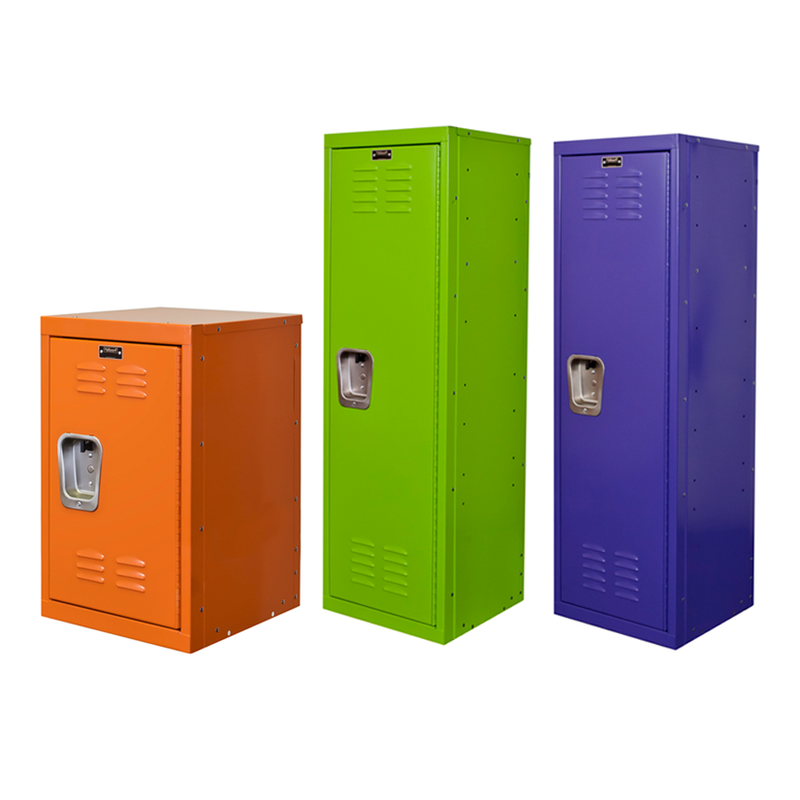 We take special pride in ensuring that each locker is a true work of art. 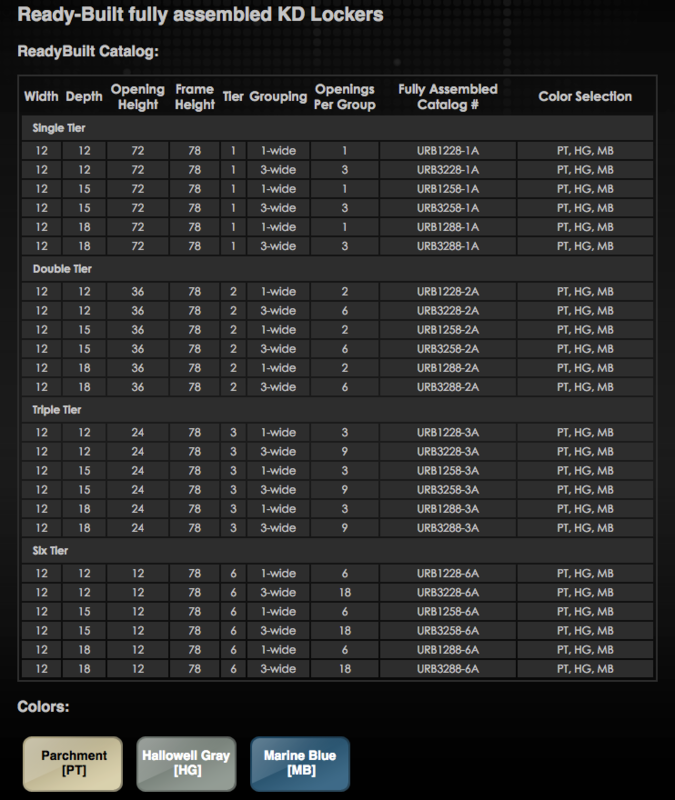 All are made in our own manufacturing plant and shipped directly to you. HOOKS: Two single hooks per single and double tier opening. One double prong ceiling hook for triple tier. 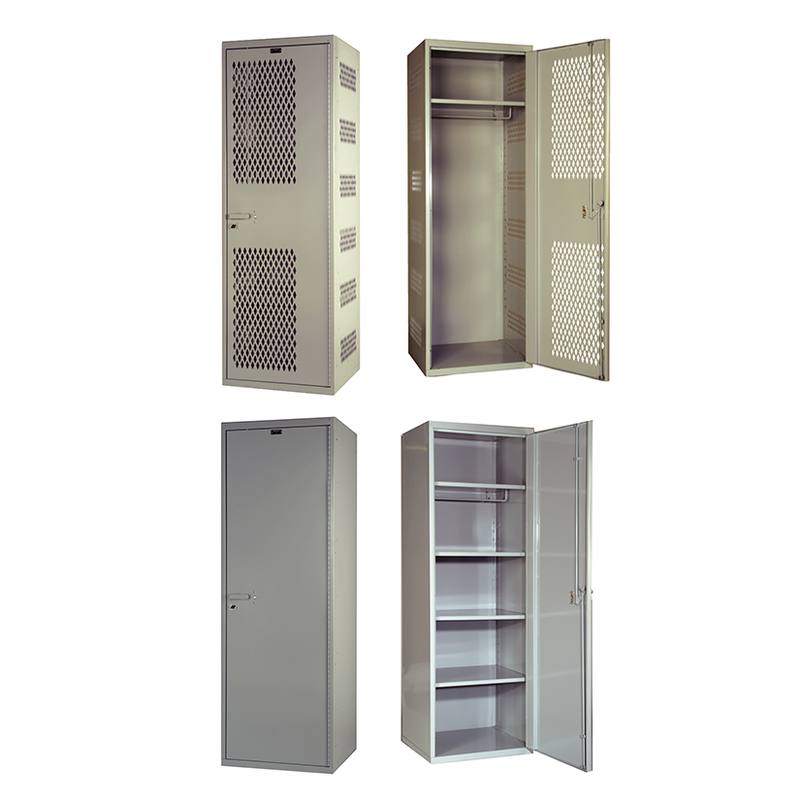 SHELVES: Hat shelf in single tier lockers only. 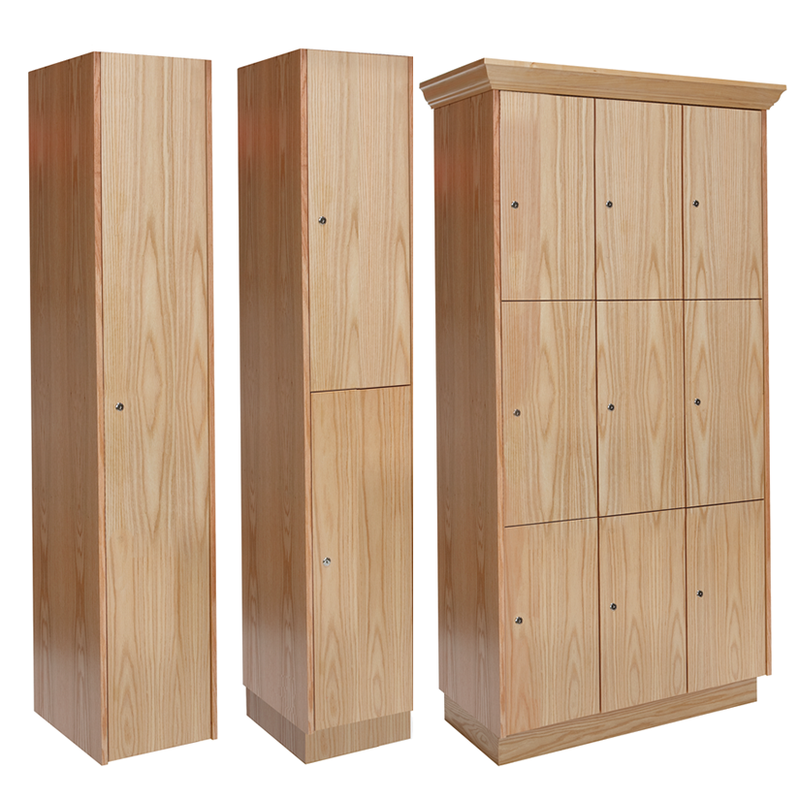 BODY CONSTRUCTION: Wood lockers shall be fabricated from ¾” plain sliced red oak plywood throughout including sides, backs and hat shelves. 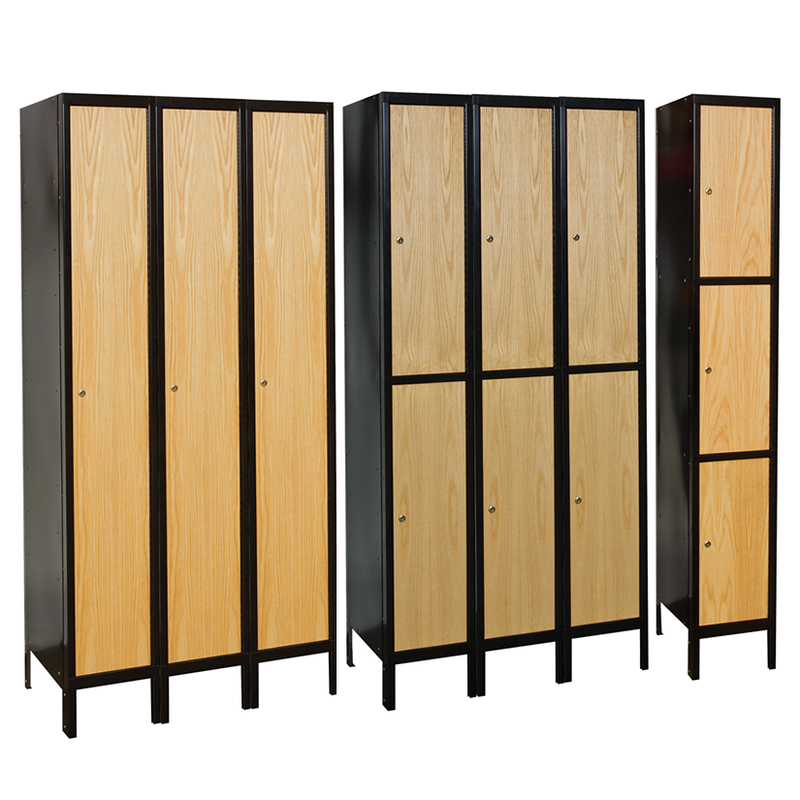 finish: All interior/front faces to be finished with a three coat catalyzed clear cabinet lacquer or equivalent. 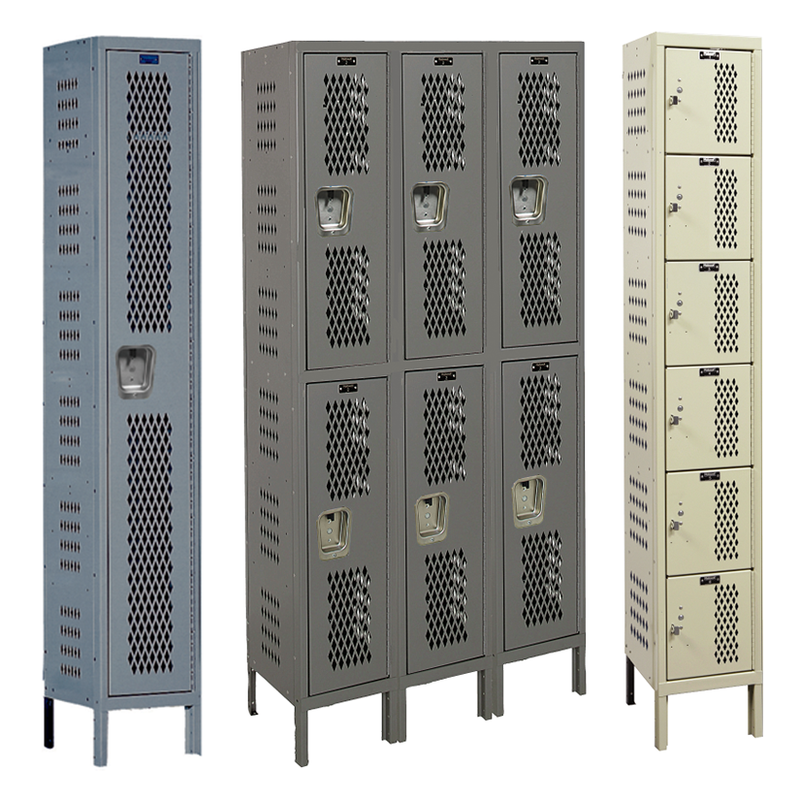 Aquamax Solid Plastic Lockers are Ideal for applications where high humidity, moisture and water are present. 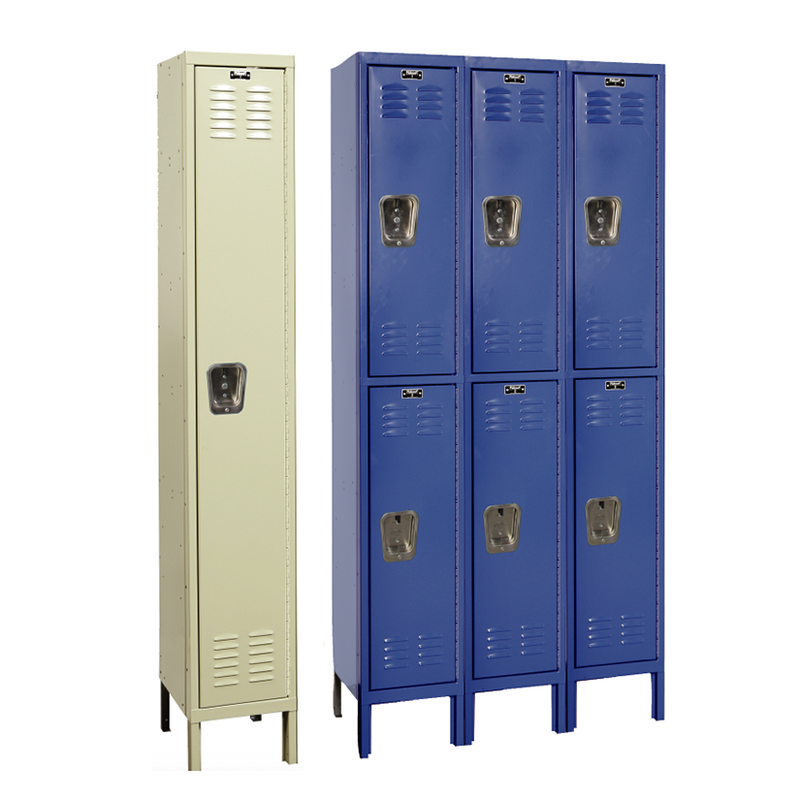 Plastic lockers are fabricated from solid high density polyethylene panels (HDPE) for maximum strength and durability while providing corrosion resistance to most common chemicals. 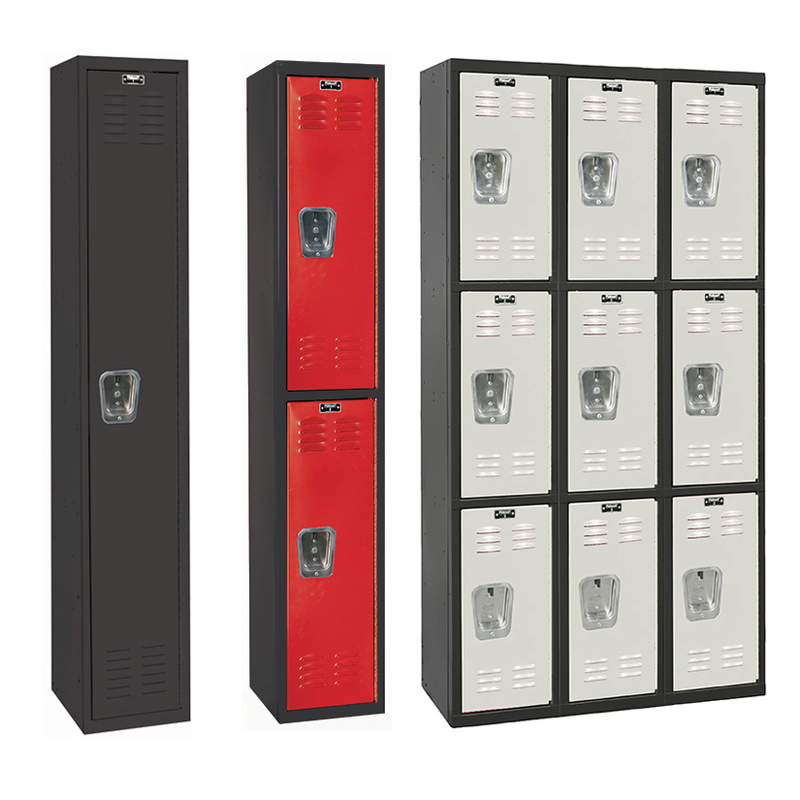 HOOKS: 2 single-prong hooks in single and double tier lockers. 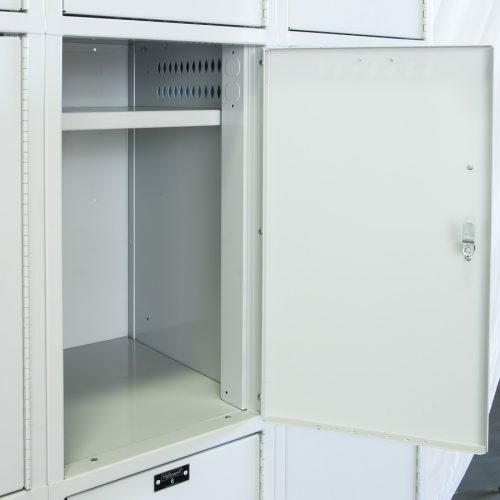 MedSafe AquaMax lockers are manufactured with high density polyethylene (HDPE) that contains a specially formulated ANTIMICROBIAL agent that permanently resists the growth of bacteria, mold, yeast and mildew. 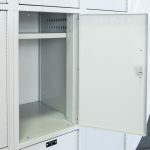 This special feature combined with all the great features of our AquaMax lockers make these lockers ideal for use in medical, educational, retail and manufacturing environments. 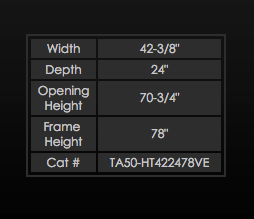 Sides and backs are 5/16″ thick. 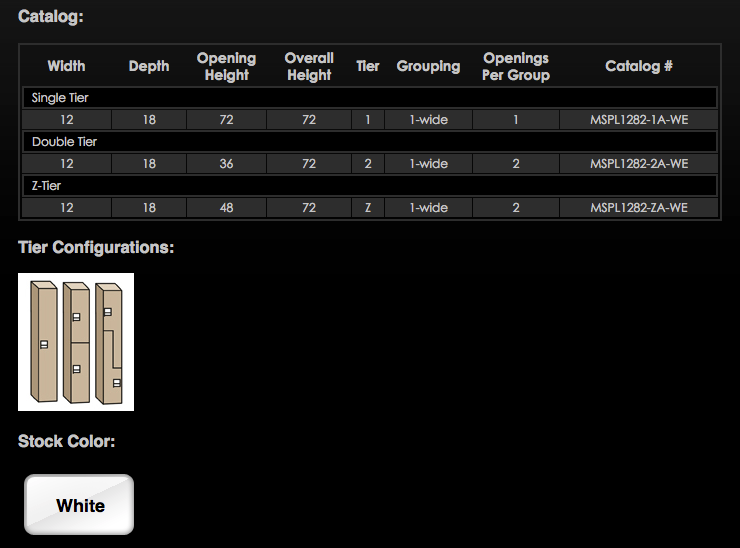 Tops, bottoms, and shelves are 3/8″ thick. 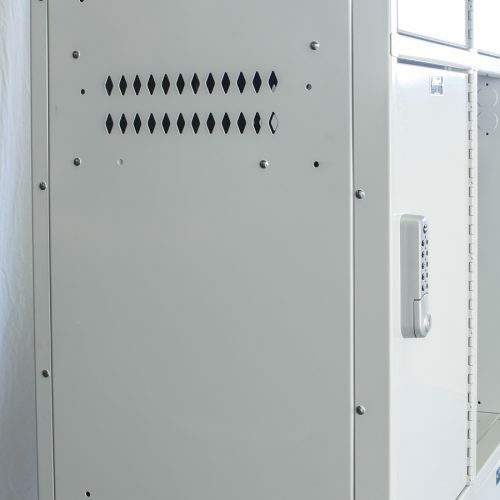 Phenolic’s unique non-porous surface eliminates the ability for mold, bacteria and mildew to grow making it ideal for wet areas. Graffiti resistant, water resistant and easy to clean. 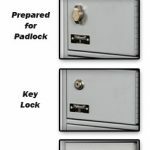 Prepared for padlock (not included), electronic lock, or key lock (included).